Halloween is right around the corner and we have been enjoying lots of silly and fun Halloween themed books and activities. 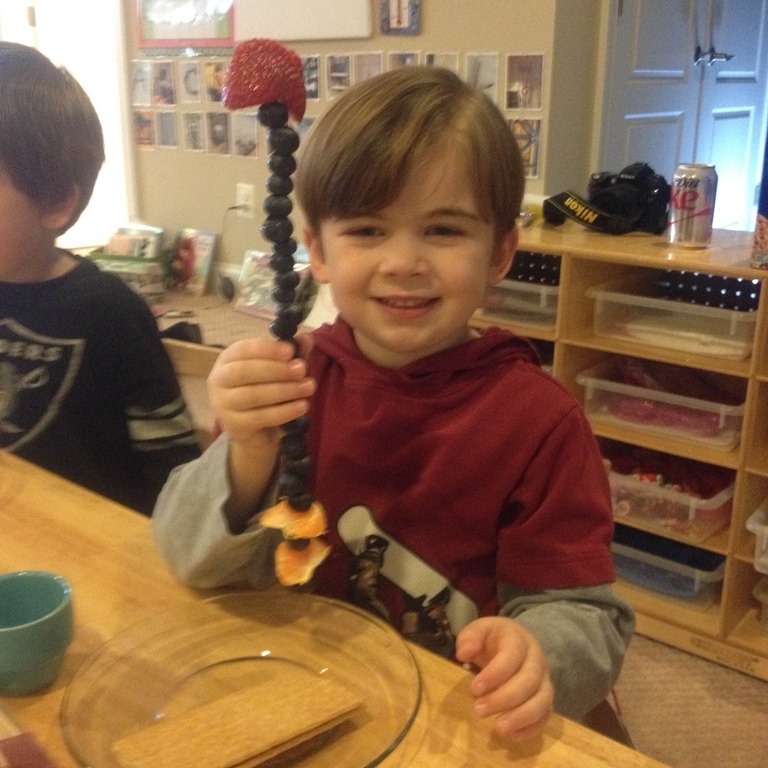 I have tried to weave in a number of activities using acorns, leaves, and pumpkins while also having fun with all of the Halloween excitement! After reading many books about pumpkins we discussed the life cycle of the pumpkin, and the children put in order life cycle cards as a group. We Modge Podged pumpkins with pieces of tissue paper. They chose a pumpkin, put glue on the pumpkin, and then carefully glued a small piece of tissue paper on top of the glued area. 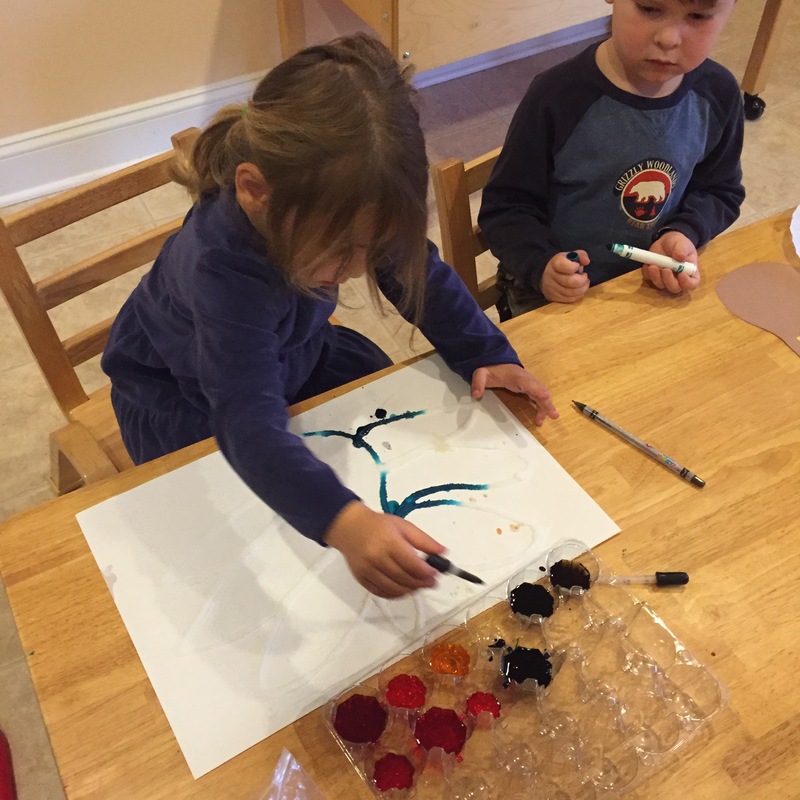 It was a delicate art task, and they did a beautiful job! Each of the pumpkins turned out very unique! We are still in the process of completed a class Pumpkin Investigation! More details on that coming soon! Last week we read this silly story, “Where’s My Mummy?” The children thought it was so funny that the Mummy was scared of a teeny, tiny mouse after seeing all of the other Halloween creatures creeping around at night. “Big Pumpkin” is another holiday favorite! Each of the Halloween characters tries to pull the pumpkin, but can’t do it. Of course the tiny bat has a great idea to work together, and they pull the pumpkin off of the vine! 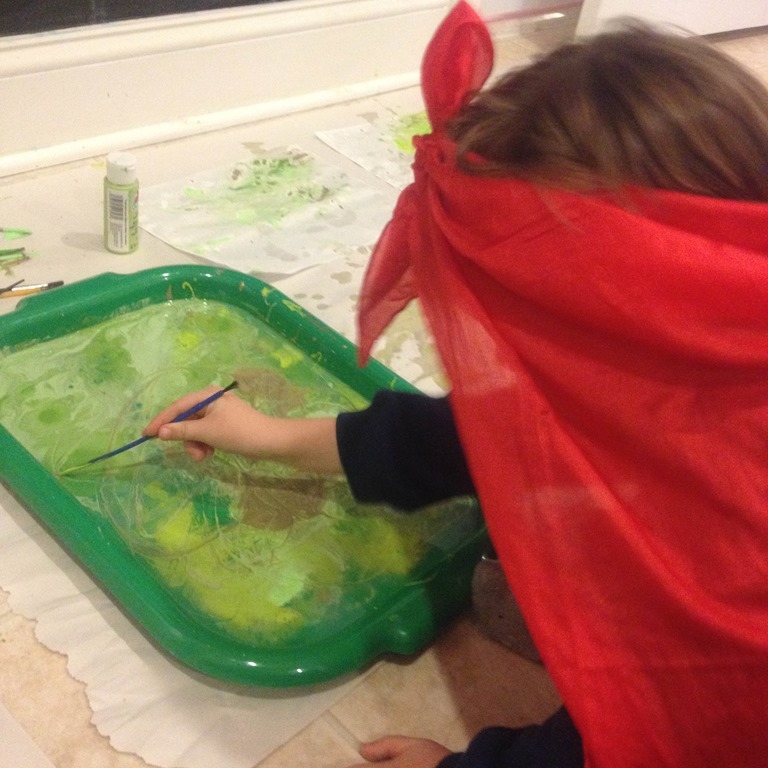 We have had a lot of opportunities to get our hands dirty with Halloween sensory play! They came into the classroom last week to find our sensory tub filled to the brim with black beans, and lots of fun Halloween items to explore! Today the children got to make Oobleck with me for the first time! 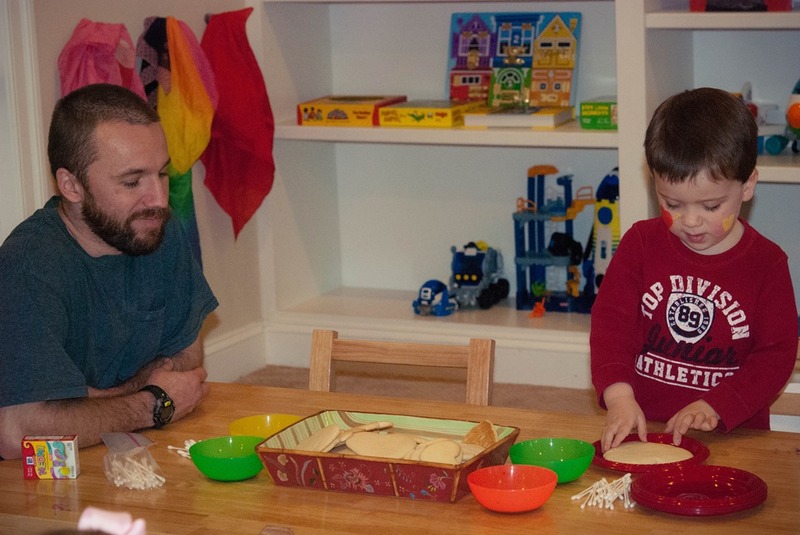 This sensory recipe is always tricky for me to perfect! It is a simple combination of cornstarch and water. But, the combination has to be just right to get the solid/liquid/sticky/drippy substance just right. 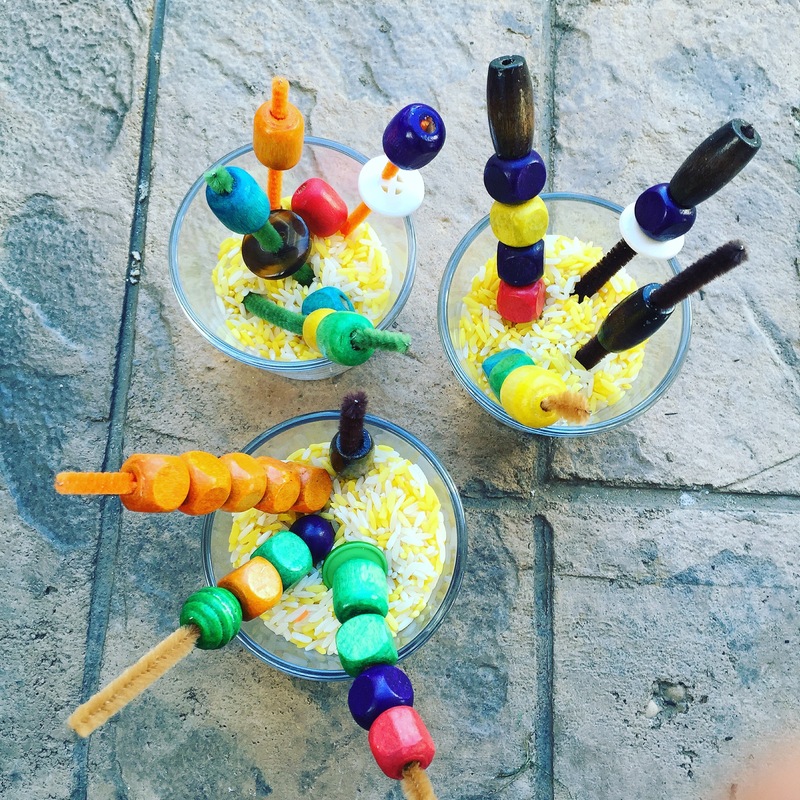 If you want to make this at home, here is a link to Fun at Home with Kids. She has a great recipe for it! We made one tray of purple and one tray of black oobleck. We were able to get the combo just right, and it was super, slimy fun! 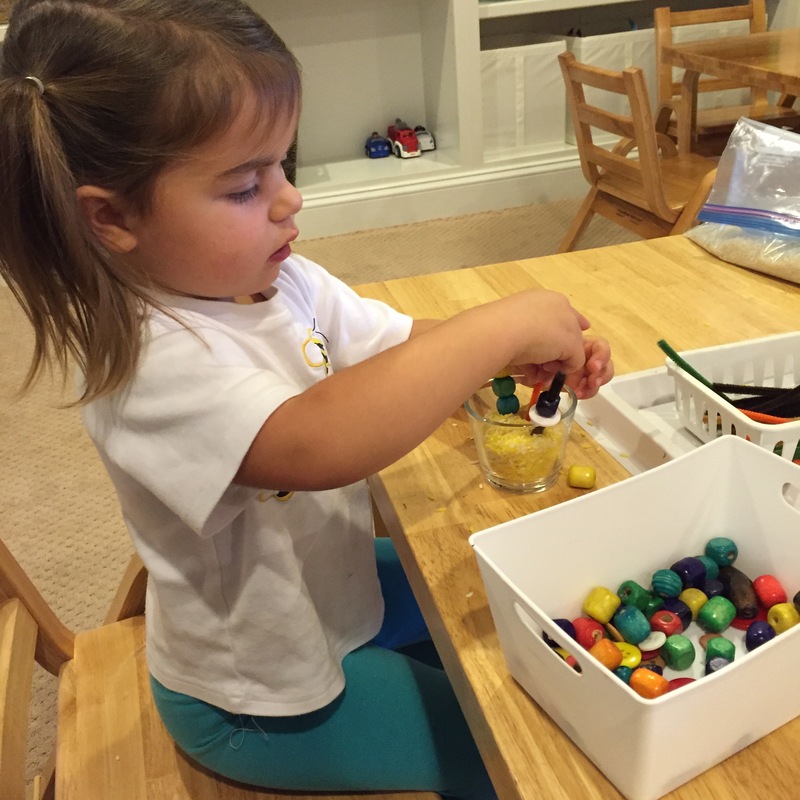 We have been working on our counting, one to one correspondence, and using objects in our to count with every day! We used the acorns we collected to practice our counting outside on the blacktop! Some children worked by themselves, and other children worked as a team! I’m proud of their progress! We have also counted pumpkin gems on the light panels. We used the dry erase markers, and they have worked on writing their numbers next to each circle. Last Thursday our class all went together to a local farm for a field trip! To prepare for our field trip, I pulled out my giant barn, barn animals, and a tray of oatmeal for the pumpkin patch. There was a lot of pretend play around the barn, and this led to discussions about what we were going to see and do at the pumpkin patch! All in all it was successful first field trip! What a busy month, with more fun things right around the corner! 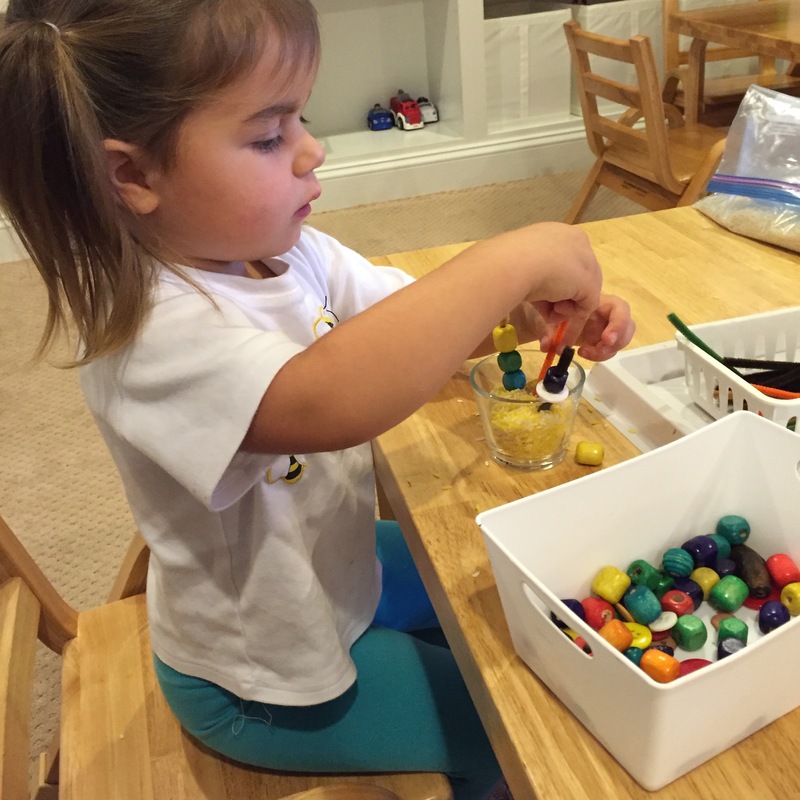 Categories: early childhood education, field trip, preschool, play based learning, Uncategorized | Tags: counting, fall, fall sensory bins, fall themed units, fall themes, field trip, halloween, halloween preschool activities, holidays, light and shadow, light and shadow project, numbers, preschool math, preschool science, pumpkins | Permalink. Before I jump right into The Mitten and all of our new animal adventures, I wanted to share some of our last few Valentine’s activities we did throughout February. Unfortunately this past month was really interrupted with National Holidays, teacher workdays, and lots and lots of snow! We would just get started with something and then get interrupted for a snow break. But, we managed to squeeze in some Valentine’s Day fun on two different days. The blog has been quite quiet the past few weeks while I have busily working on assessments and portfolios. I was able to write a portfolio for each child in the class, and meet individually with all of my parents. It was so nice to sit down with everyone and discuss all of the growth and progress each child has made this year. The pictures above and below are of D, C, and H playing in our huge sensory tub of pink salt. I died many large boxes of salt pink, and then added scoops, glass containers, long pink spoons, heart gems, and a giant restaurant style salt shaker. The kids quickly figured out how to unscrew the lid and fill it up with salt. Then the boys would hold out their scoops and wait to have them quickly filled by the giant salt shaker. 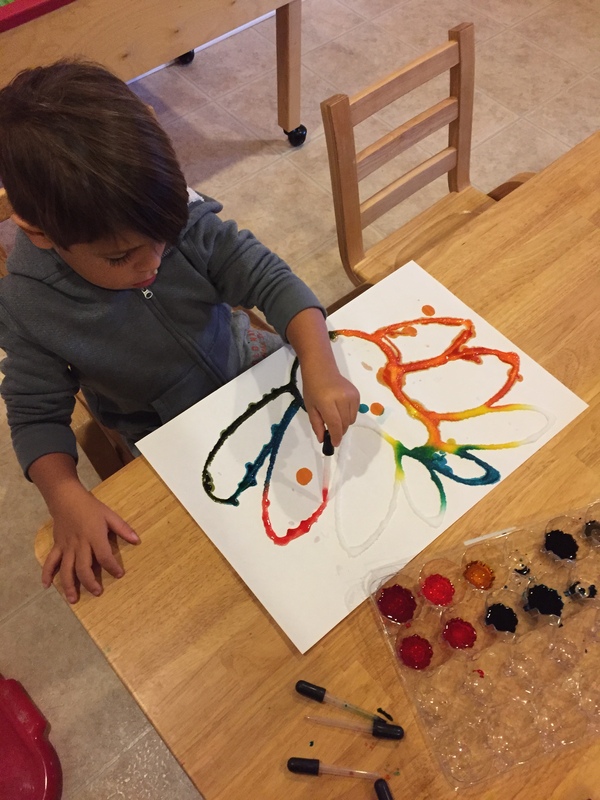 This activity builds fine motor skills, cooperation, verbal skills, problem solving, and scientific processes of pouring and filling. They were busy with this tub for quite some time. J brought in the most beautiful sunflowers for Mrs. Brittany and I for Valentine’s Day. 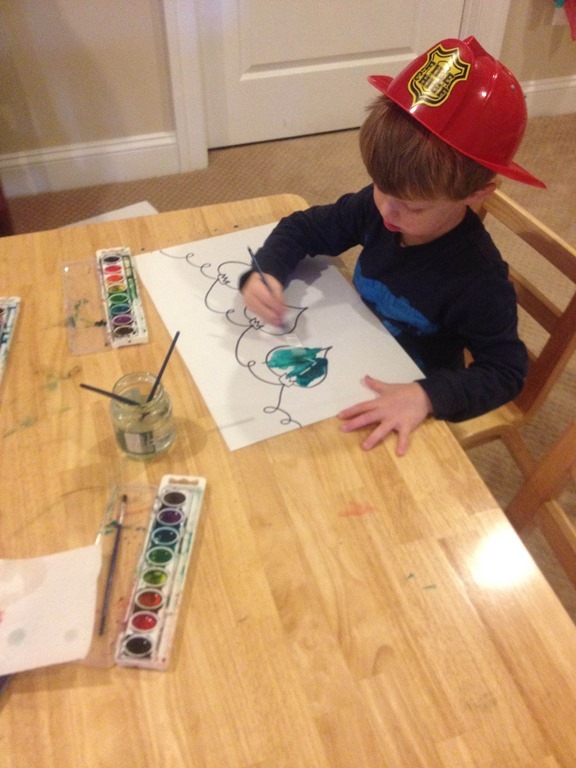 As much as we were enjoying them, we decided to put them in the art studio as an invitation to create. I put the flowers in a large vase next to the easel with yellow, brown, and green paints. 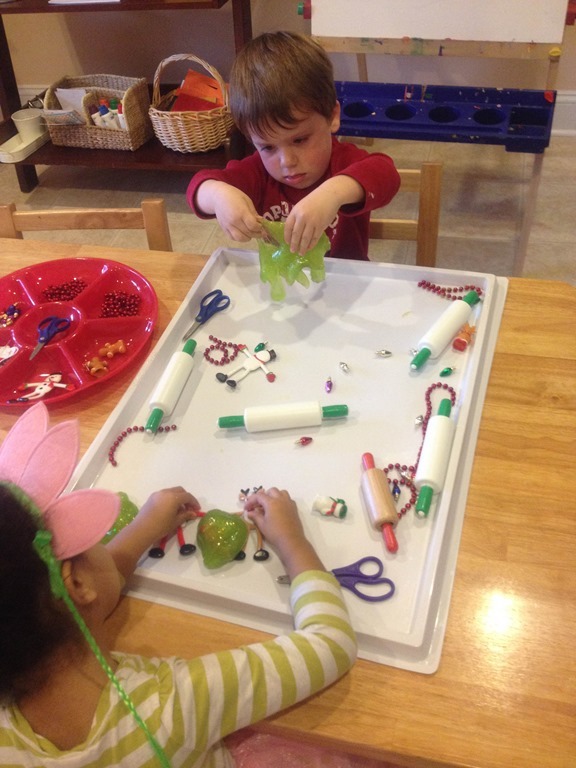 For some fun fine motor work I covered a table with long strips of crepe paper. The children each got to stand at the end of the paper and cut all the way down to the tape. This provided a fun way to cut using scissors in a new and different way. We turned it into a cutting race to see who could make their way to the tape first! Our new sweet friend A started coming to school in the past few weeks. 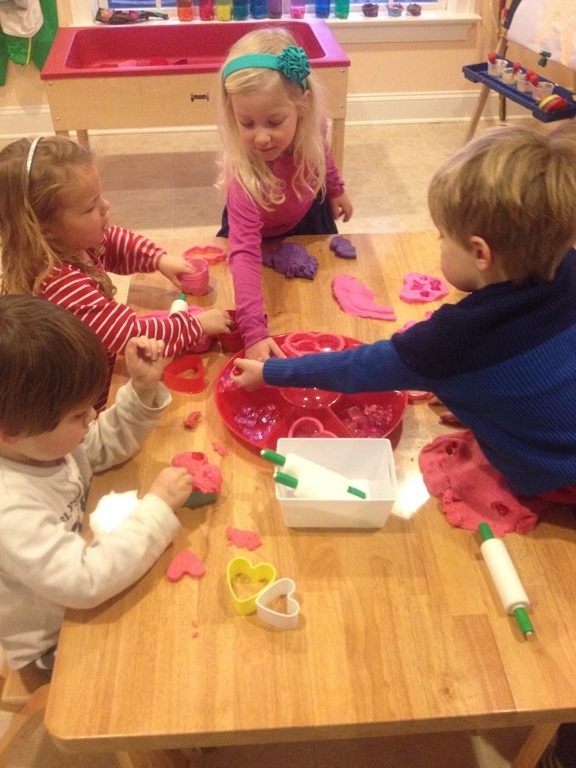 She had a great time making new friends, and getting adjusted to life at Crozet PlaySchool. 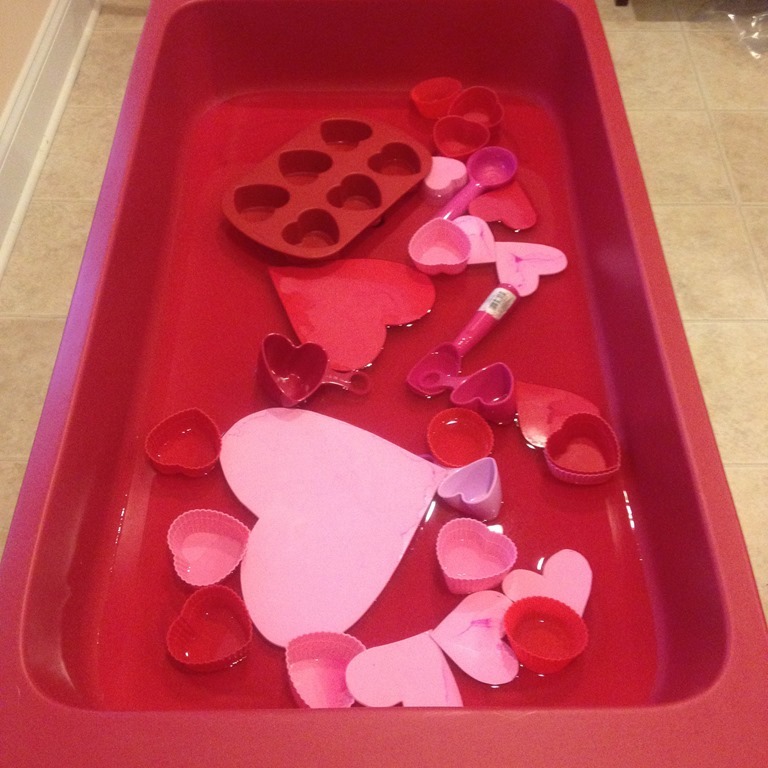 A quickly discovered the Valentine’s themed learning trays. 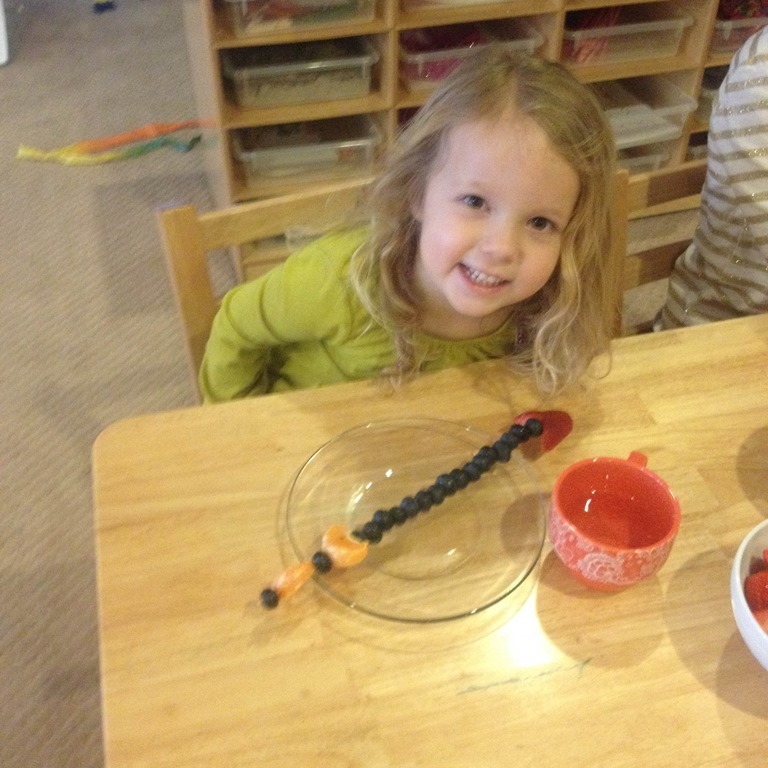 She made some bracelets for mommy and daddy. 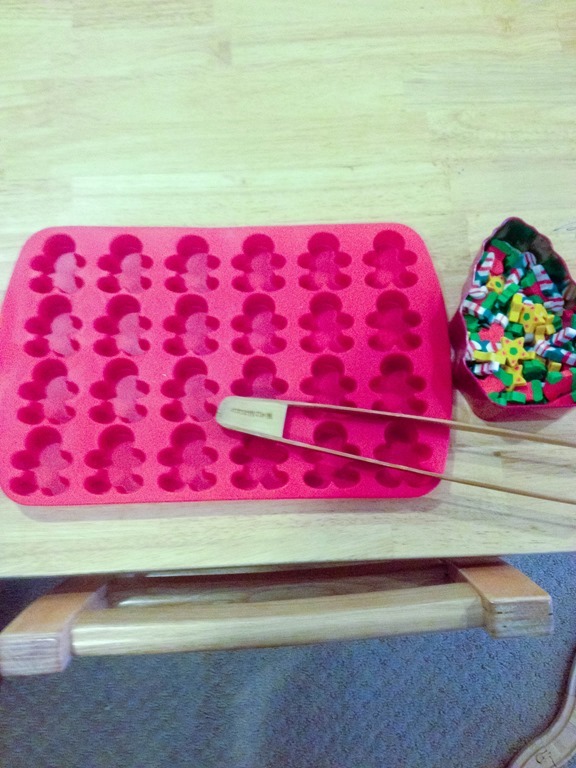 A and A spent a long time moving our winter erasers from the container to the muffin tray using the tongs. She also explored the jump ropes with her buddy A outside. We kicked off our study of animals by reading one of my favorite winter stories, “The Mitten” by Jan Brett. After reading the book a number of times in the morning, we acted out the story using large puppets from the Jan Brett website. If your child is still interested in the book and would like to learn more, Brett has a fabulous website with lots of resources. I brought a large sheet down into the classroom and we clipped it onto the chairs to make a large mitten fort. Then each child got to act like their animal as they crawled, dug, or hopped their way into the mitten. Lastly our mouse got in the mitten and caused the bear to sneeze! This was a wonderful way to incorporate early literacy skills such as story parts, characters, and problem solving. To give the students another way to “act out” the story I opened a snow sensory tub. We made a batch of “blizzard in a box,” and then I added the figurines from Safari Ltd that matched the story. 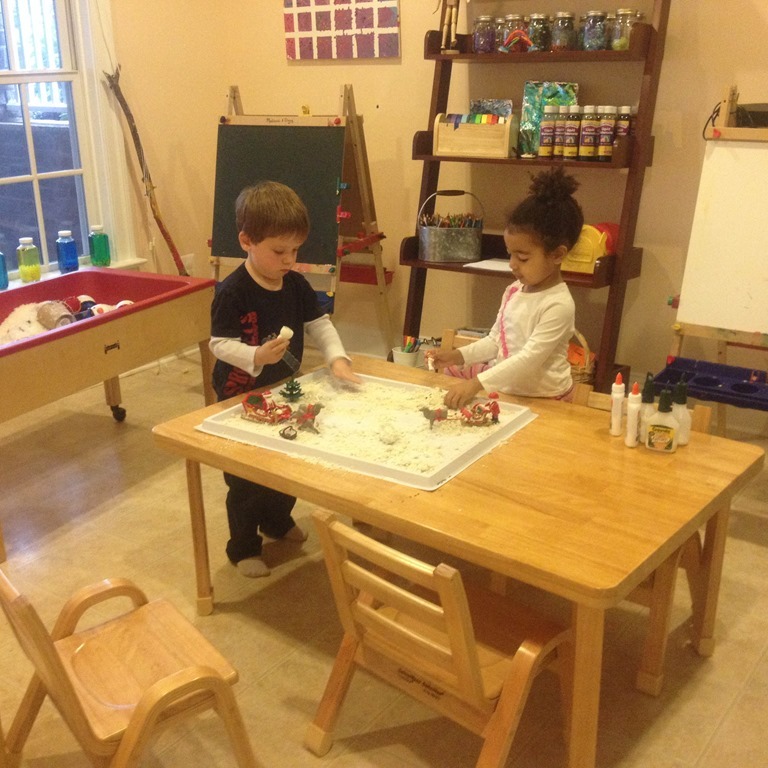 They had a great time hiding the animals in the snow and making snowy forest scenes just like the book. 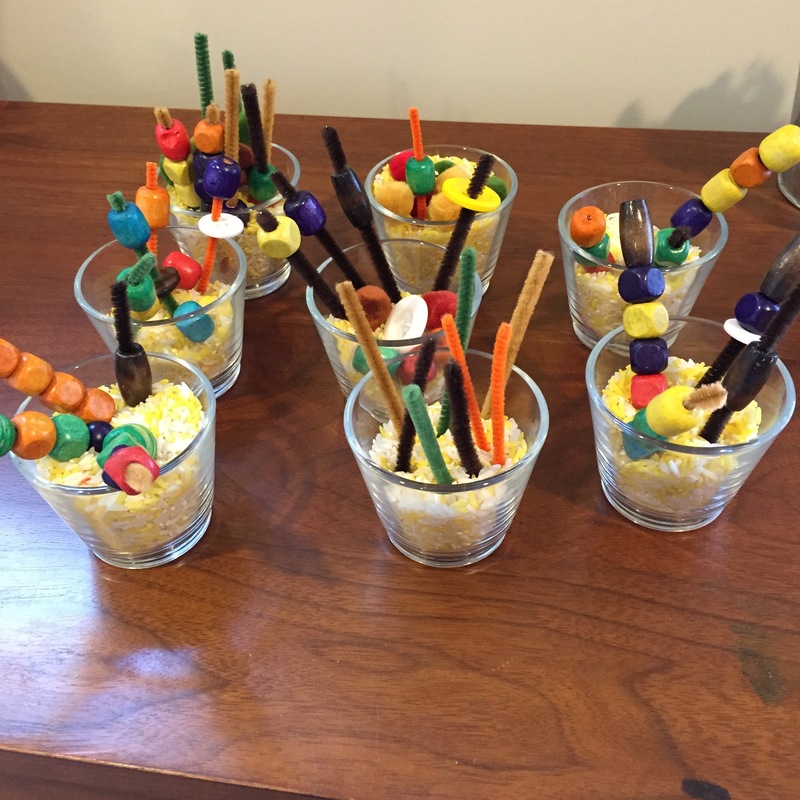 Also to go along with our kick off to studying animals Mrs. Brittany came up with this simple and very popular sensory tub!! 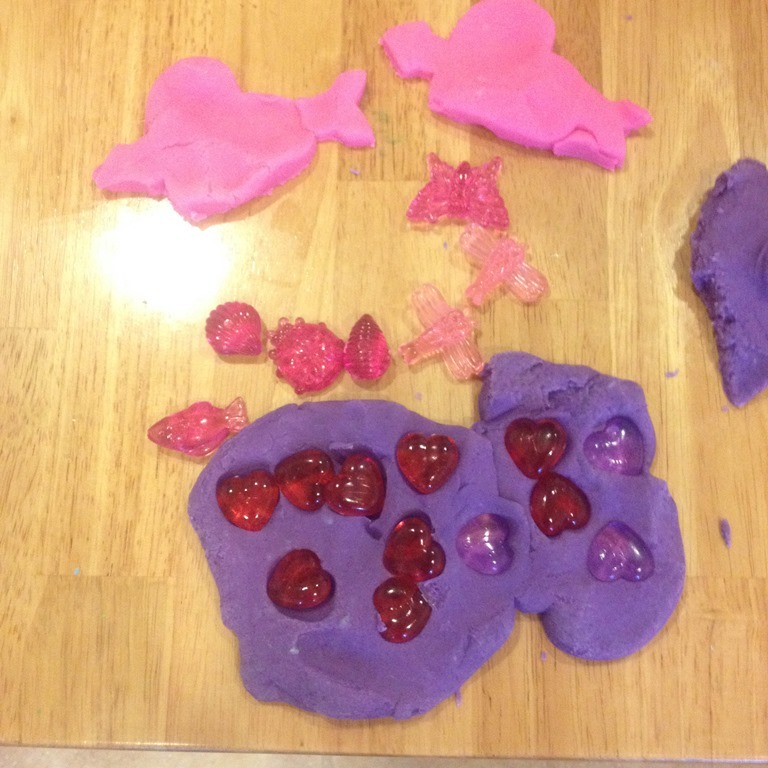 She added our large safari animals, soap, water, scrub brushes, and sponges. The children got busy washing, scrubbing, and bubbling up the animals! I love to see all of their little hands reaching into the tub to get wet and soapy! D scrubbing the lion very carefully. We also played some great animal inspired games last week! The game pictured above is called “Hiss.” A bunch of students were playing with us, but of course they walked away when I took the picture. 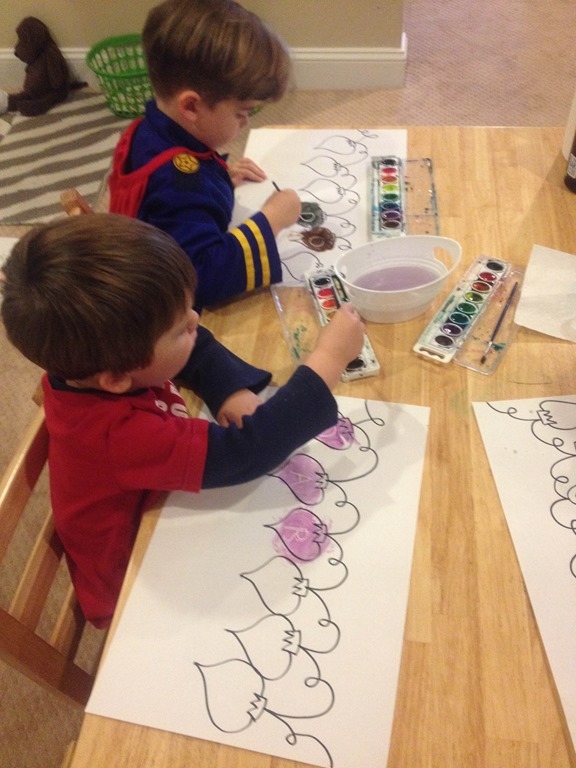 Each child draws a card and they add it to a snake on the table by matching up the colors. Once the snake gets a head and a tail it is complete and the player says “Hissss” to keep their snake! It was a great game for color recognition, problem solving, turn taking, and practicing patience. 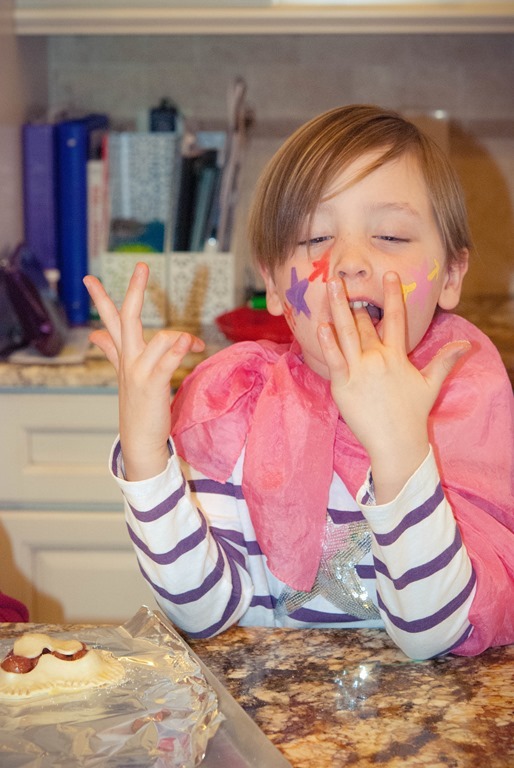 Although we had to postpone our Valentine’s Day celebrations, we still squeezed in some time to have fun. We got to bounce in the bounce house one morning! These were the best pictures I could get! Each child got to roll out their very own pretzel, and shape it into a heart. 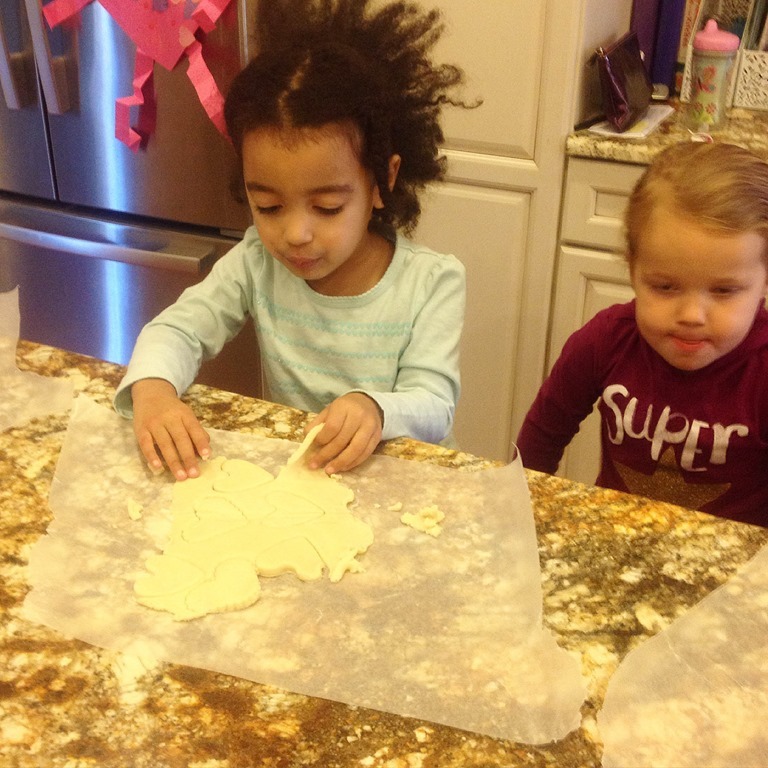 Here is B and D rolling out their pretzels. They went straight into the oven and into our bellies before I could get a picture. 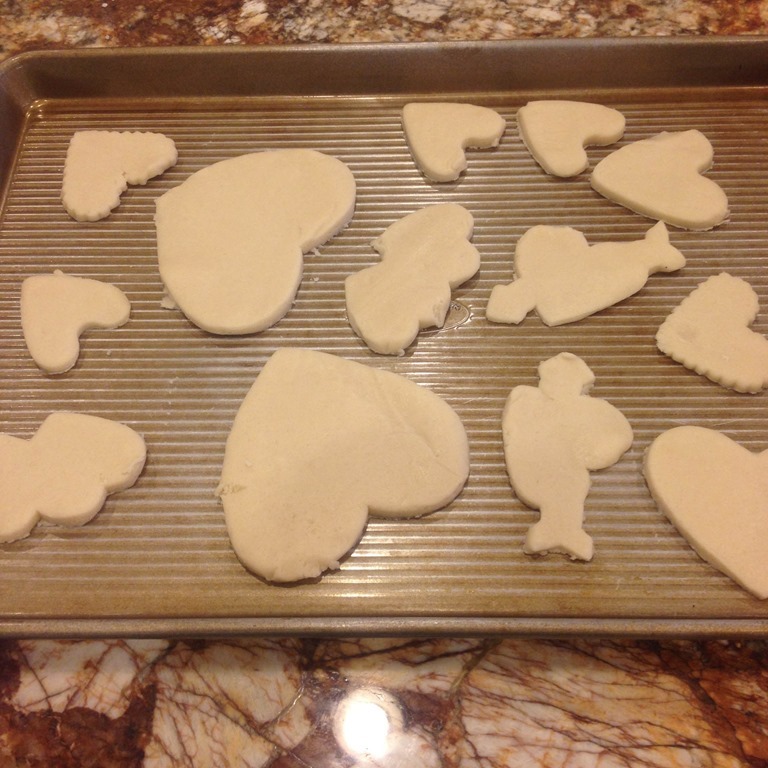 Once our pretzels were finished cooking we enjoyed them and M’s special heart shaped cookies for her birthday! 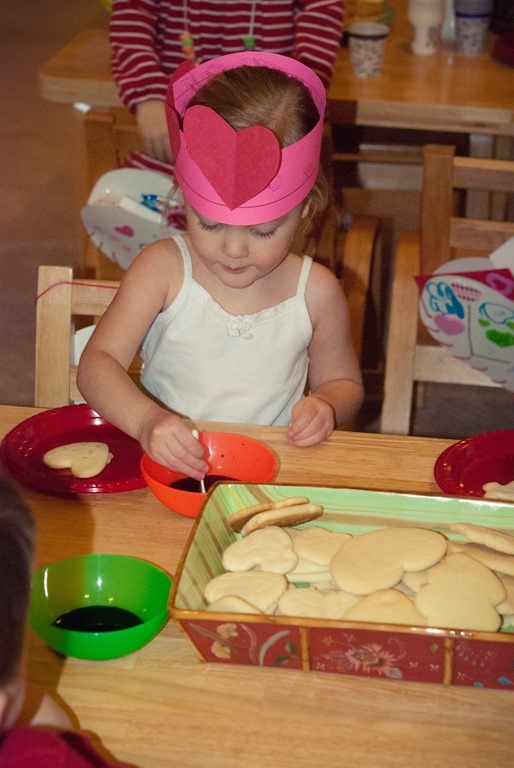 We even got to decorate the cookies with pink and white icing! Yummy! Mrs. Kay also brought some new mats and a new format for our yoga time recently. Instead of reading us a book and working on poses throughout the story, she told us a story out loud. We had to listen to the story and then we posed as different story parts. The picture below shows everyone trying to reach behind their legs to be a spider. It was hard! And our favorite part of yoga, savasana. Ahhhh relax and breathe. We had a few extra minutes at the end of yoga, so Mrs. Kay joined our mats together into a long line and we made a “Dragon’s Rainbow.” Everyone got into downward dog, and then the first person crawled under the tunnel and went into downward dog at the end. This repeated again and again! It was really fun and hard work to stay up in down dog for so long! Now that we are mostly caught up, I can’t wait to share more of our animal study with you soon! Categories: early childhood education, holidays, play based learning, Uncategorized | Tags: favorite authors, fine motor, fine motor skills, holiday sensory play, holidays, learning trays, montessori inspired learning, play based preschool, preschool math, preschool science, process art, reggio inspired, sensory play, valentine's day, winter, winter read alouds, winter themes, yoga, yoga with children | Permalink. 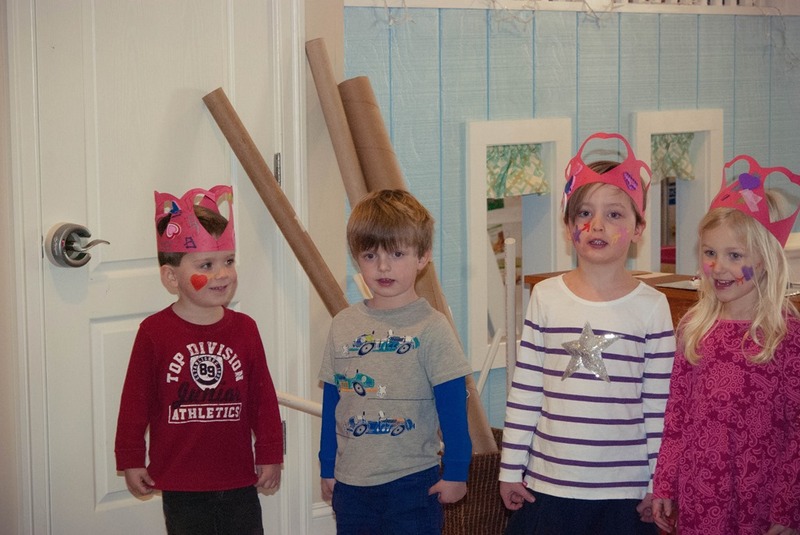 This December packed a big punch at Crozet PlaySchool. We had something up our sleeves in every corner of the room, and it was so fun to watch the play unfold this month. Above is one of our many sensory tubs this month. It was filled with Peppermint Cloud Dough! I made a huge batch of green cloud dough, added peppermint extract, and lots of fun Christmas people, baking cups, and spatulas for pretend play. This was by far the favorite tub of the month, and I actually didn’t change it because there were children playing with the dough every day! 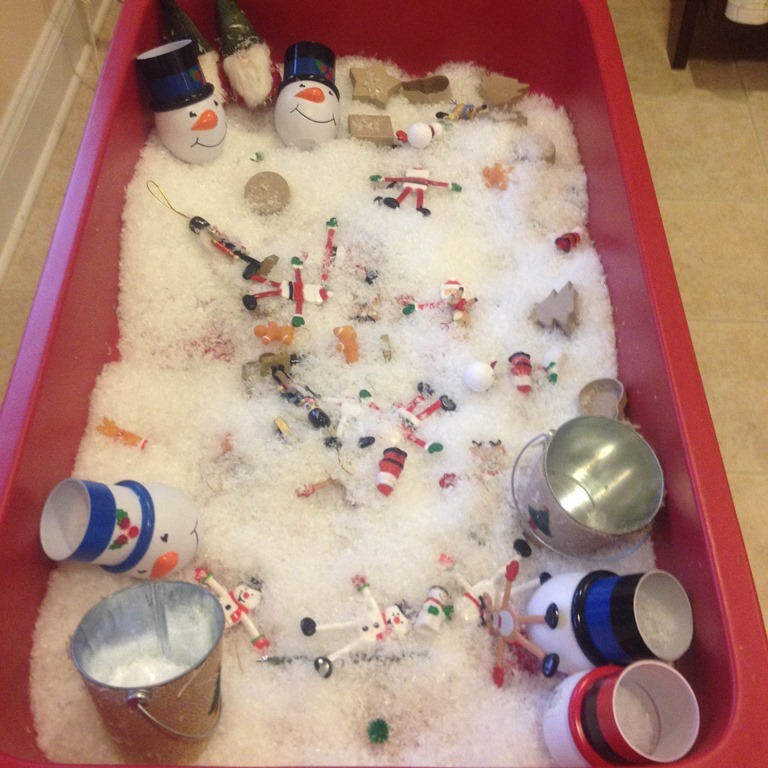 Below is another tub that was filled with pretend snow (plastic type from the craft store) and lots and lots of festive finds tucked inside the snow. The children loved to take the mini boxes and fill them with items and give gifts to each other. 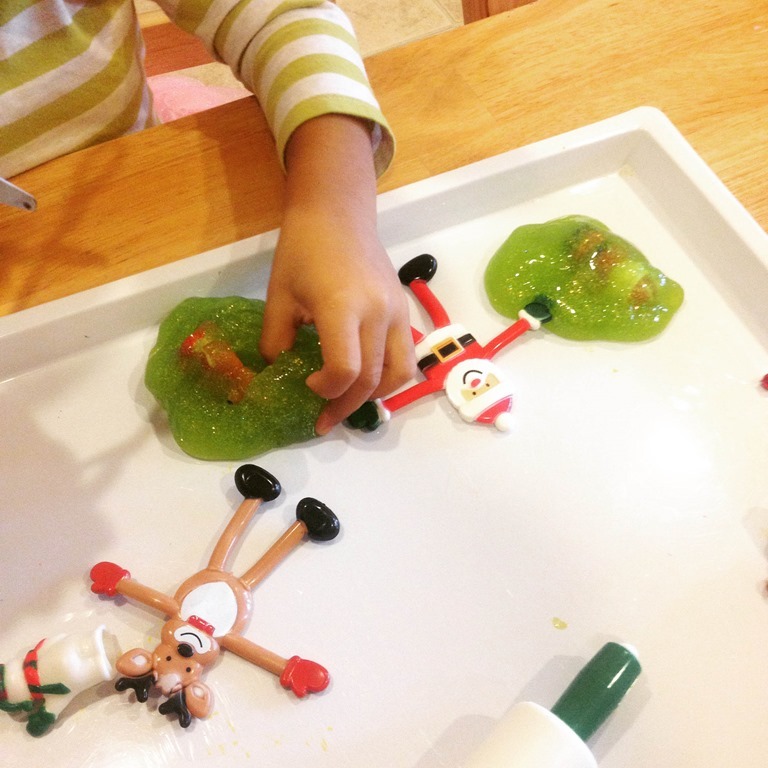 The last week before Christmas we made “Christmas Fluff.” I found the recipe from Sow Sprout Play, and it was fantastic! 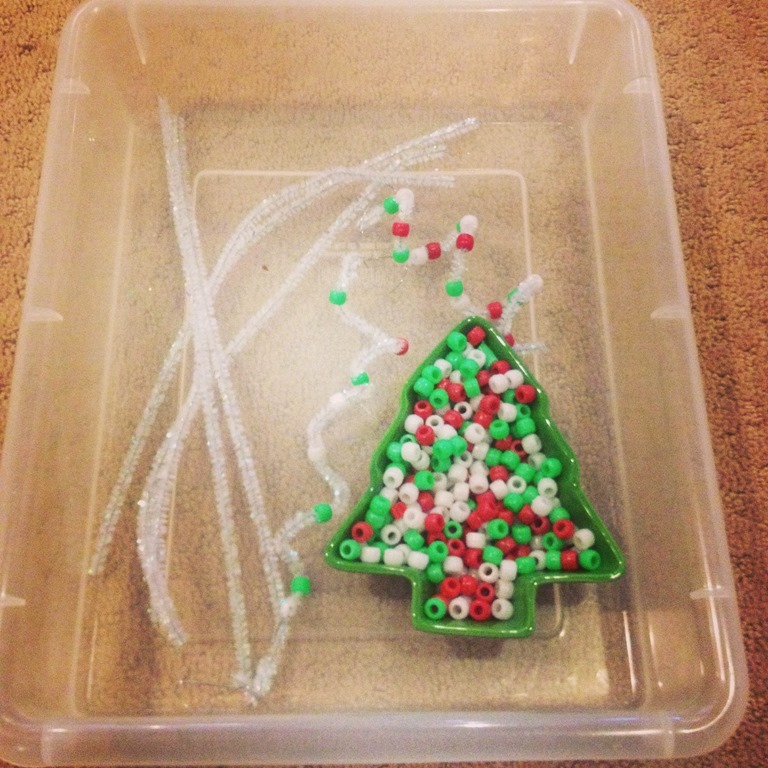 I am definitely going to make this again using different colors and bits and bobs, because the kids loved it! 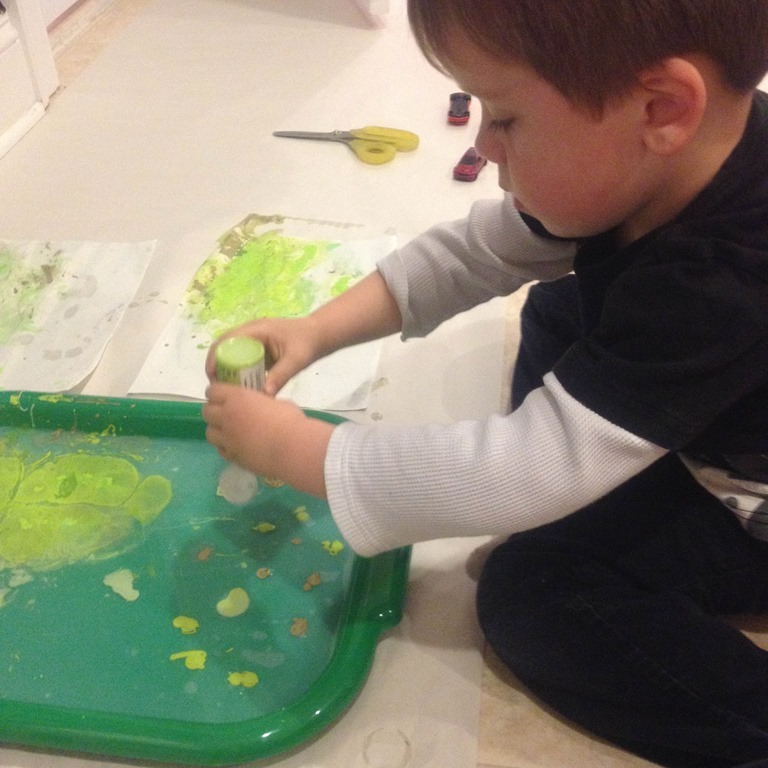 You can see from the collage below how many hands were digging into this sensory bin. This table might look like a wrapping station gone wrong, but it was actually one of the most popular table invitations this month. I left out mini boxes, jingle bells, squares of paper, table, and ribbons. The results were lots of wrapping, cutting, taping, measuring, and creating pretend presents for our friends. Below are a few of the wrapped presents I found on the table later that morning. B’s present is in the middle, wrapped with lots and lots of ribbon and tape! 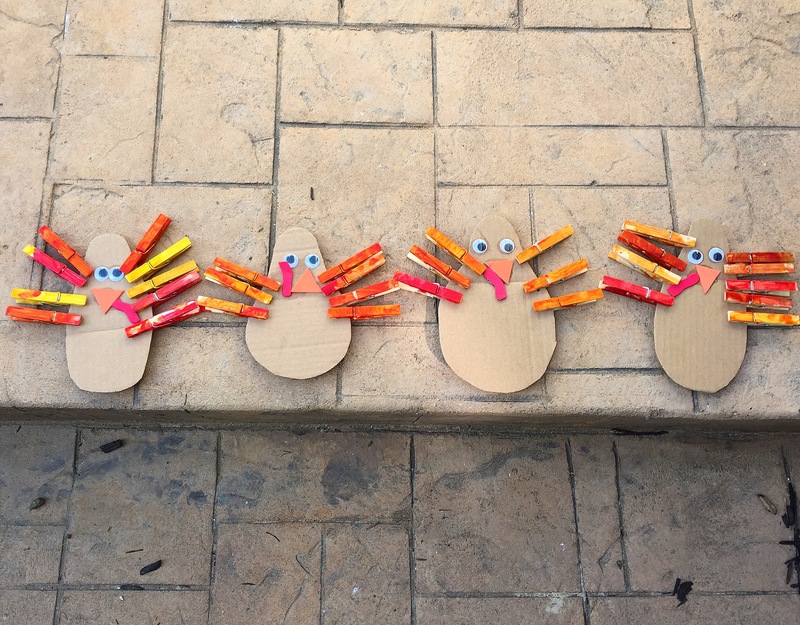 There is so much fine motor work at this station, but the children saw it as a fun seasonal activity. 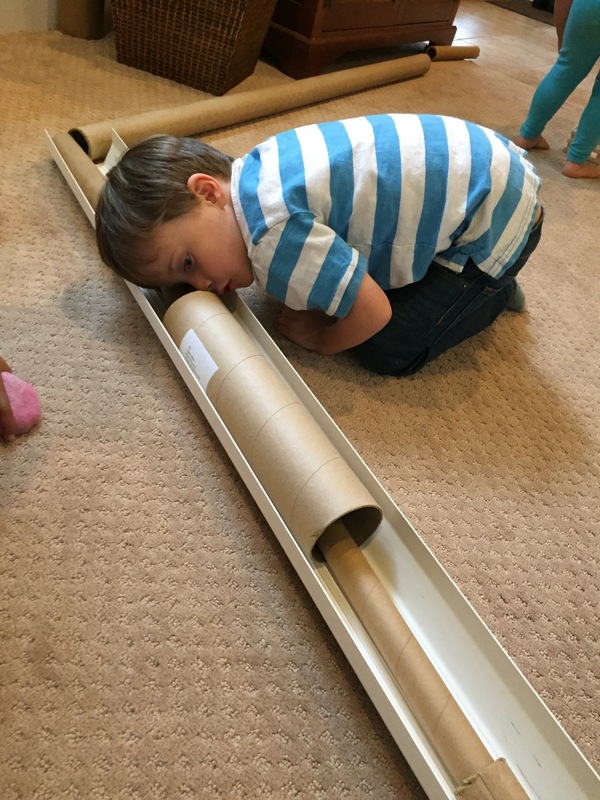 I know as a mommy, that often we get in a hurry this season and our children want to “help” us wrap, but we don’t have time to allow them to help (or maybe that is just me waiting until the last minute!). 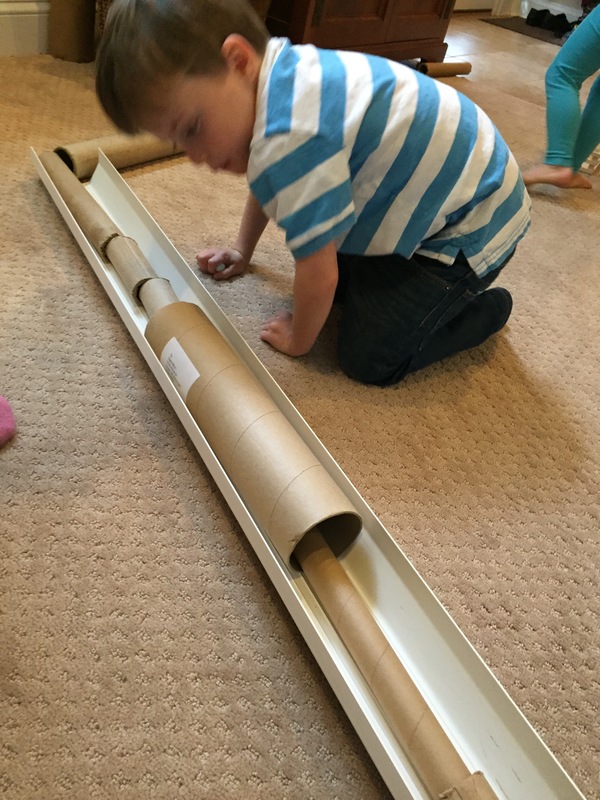 This was a great way to allow them to help and do all of the fun wrapping activities they love! D hard a work cutting her wrapping paper. Another table invitation was playmobil Santa and his friends in the snow. 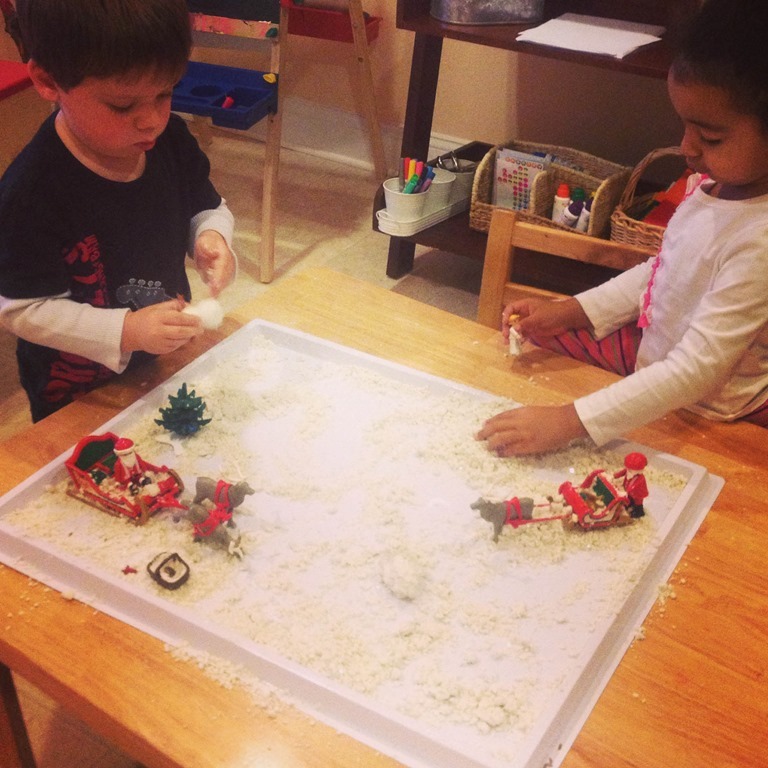 I created this table invitation using fake snow (white pebbles) and two different playmobil sets. The children loved the little parts to the tray and acting out different holiday stories. 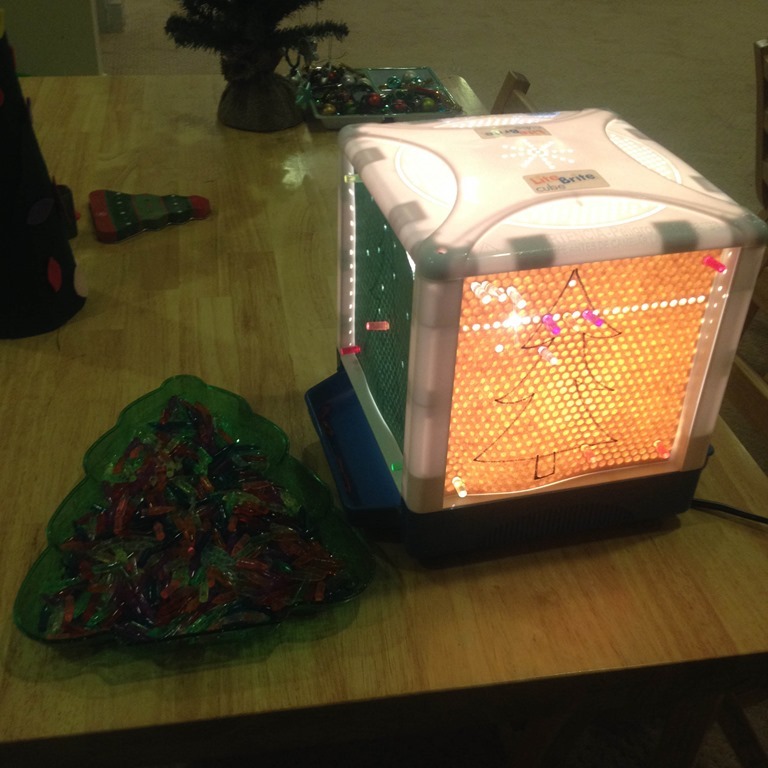 Another wonderful table invitation was the light panel, jingle bells, and a magnetic wand. A few of the boys above H and D spent a great deal of time taking turns picking up jingle bells with the magnetic wand. They tried to see how large of a jingle bell shaker they could create if they collected them all! Below is an activity I have done in the past, and I pulled it out again this year. It is a Light Brite cube! I made my own paper drawings on each side of the Light Brite. 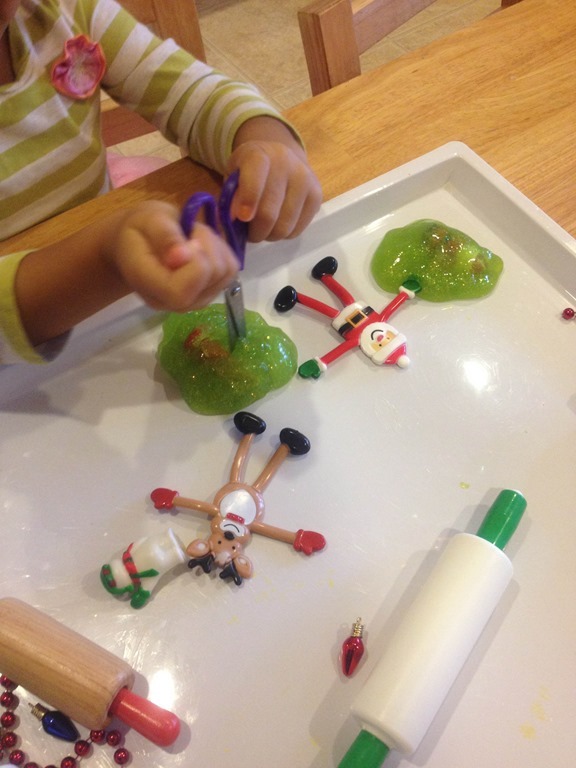 The children could stick in the pegs and make ornaments on the tree or details for the gingerbread men. Some of the children loved to just see the light come through the holes once they had been created. They spent a great deal of time just punching row after row of holes into the paper. 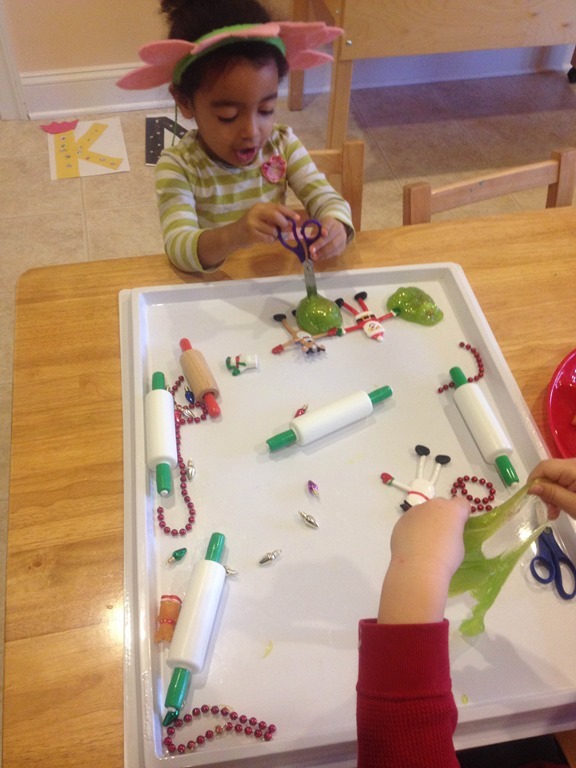 This is such a great sensory (light) and fine motor activity! The last table invitation was left out on the train table the week before our break. 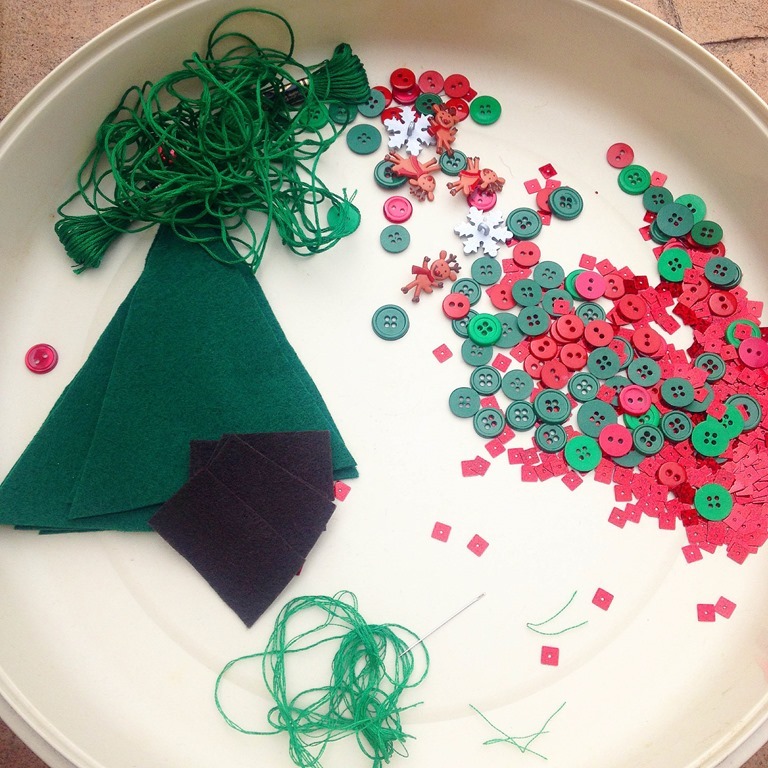 I put a large pile of Christmas colored pom poms, tree blocks, snowy trees, and ornaments for the children to play with. 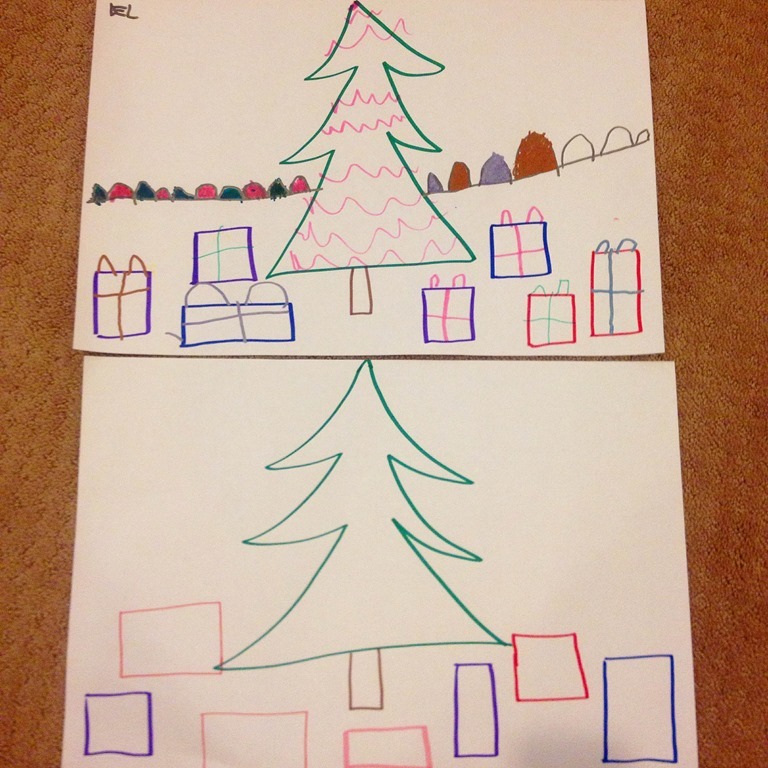 They created different scenes including the one below by setting the wood blocks up in different ways and using the pom poms and trees as a way to “decorate” their creations. 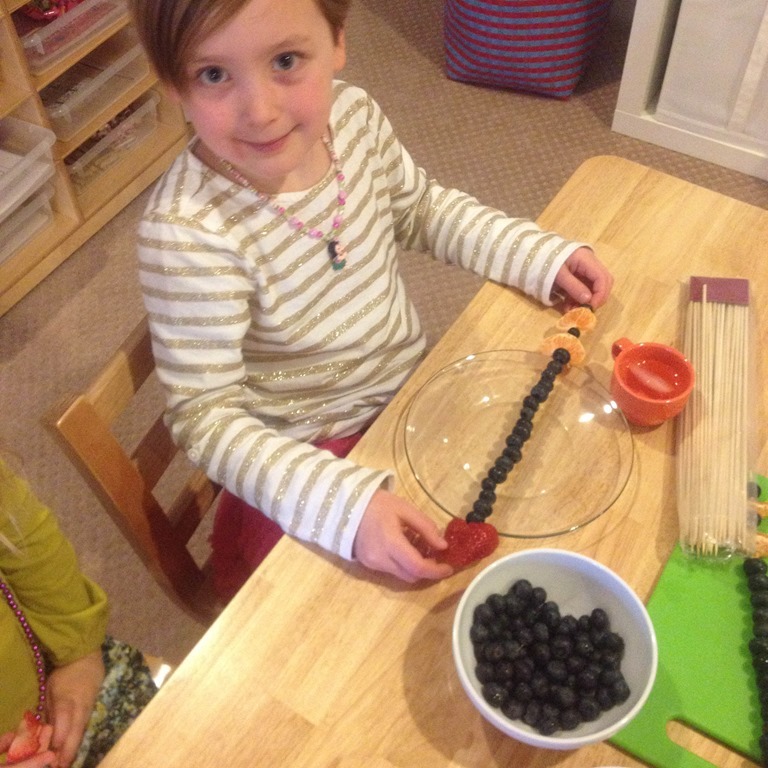 I love seeing loose parts played with in the classroom! This invitation to play wasn’t on a table, but it was located near our dramatic play area. I set up a little tree for decorating, books for reading, and different hats/headbands for acting out Christmas stories! Some more of their hard work in their journals! They added details to their snowmen including arms, faces, and hats! We also wrote our names on circles and created our own snowman using our name! The children created this beautiful Christmas Tree on our window at the entrance of the classroom. Ms. Brittany and I unrolled the contact paper so the sticky side would face the kids. 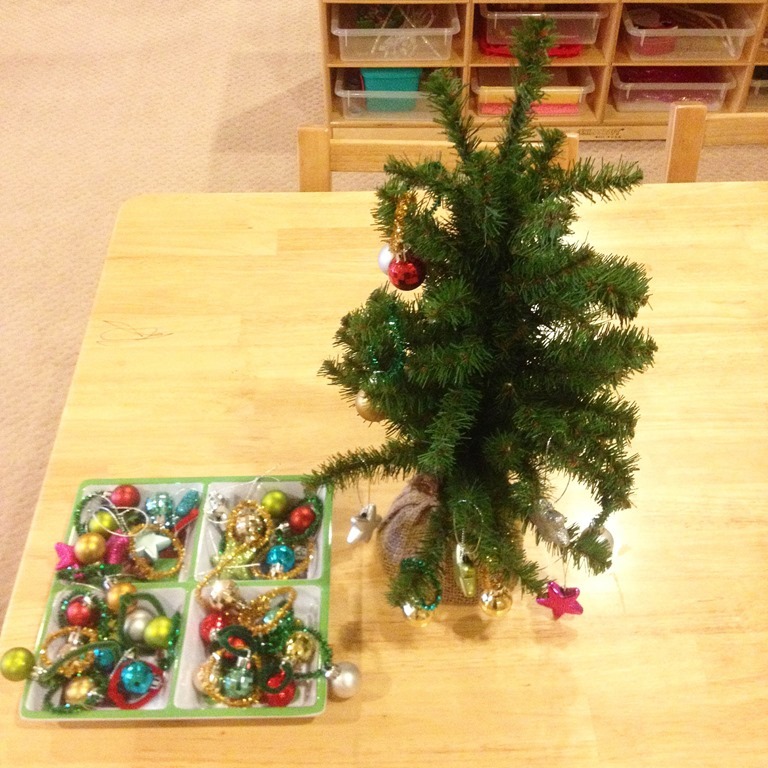 Then we offered them a variety of pipe cleaners, gems, and popsicle sticks to create a Christmas tree. The results hung on our door for most of December! 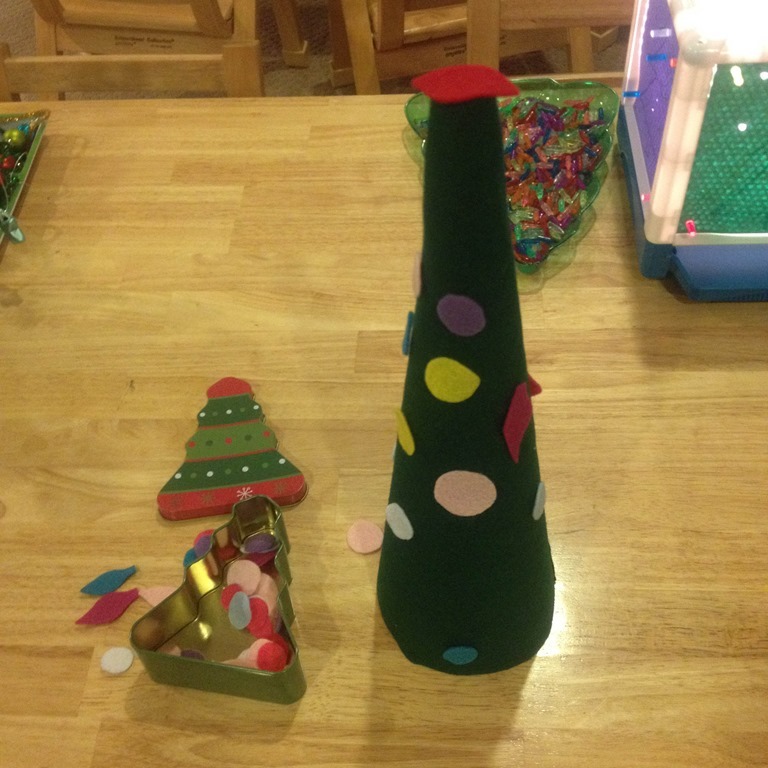 This month we also did a lot of “crafts.” Most of the activities were pre-planned for the children to participate in during the month of December. 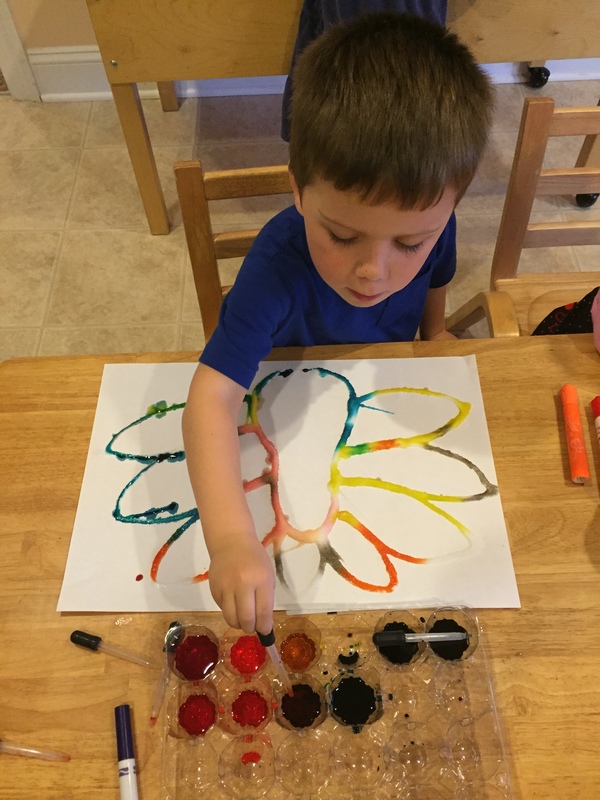 I always prefer process based art for little children, but I do feel that it is nice to do crafts that can have a specific outcome. These Christmas tree ornaments are a good example! 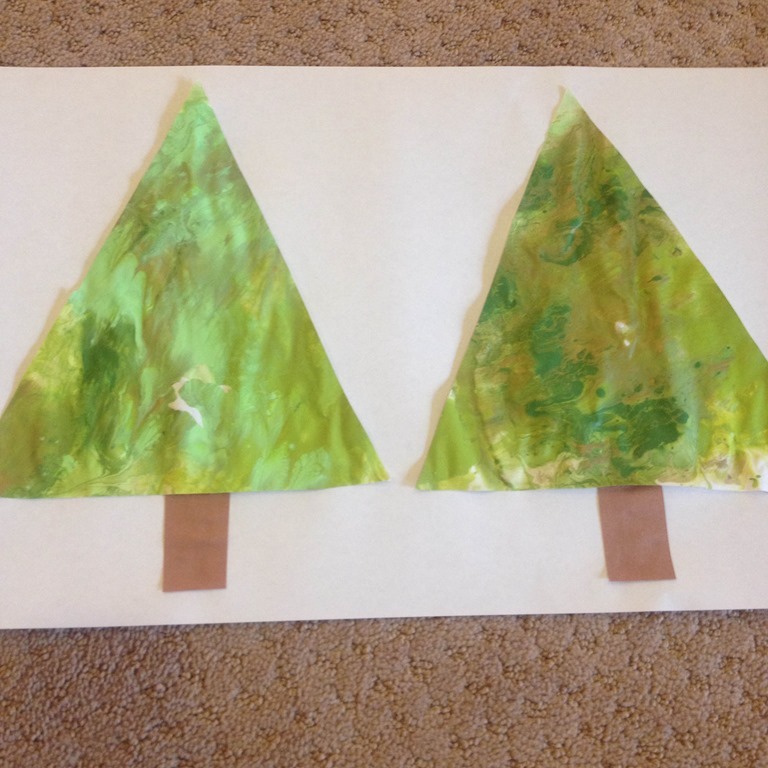 Each child completed the project in their own way, but they still could be hung on the tree at home! Lovely indeed! 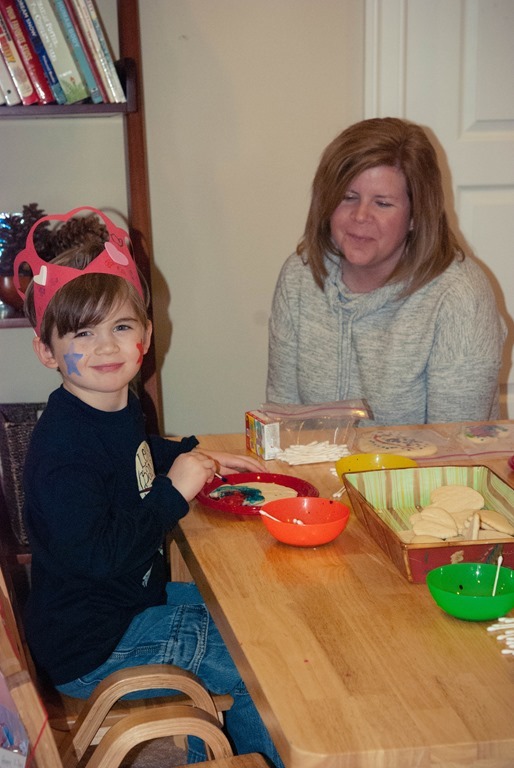 Categories: early childhood education, home preschool | Tags: christmas, christmas crafts, crafts, holidays, preschool crafts, sensory bins, sensory tables | Permalink. 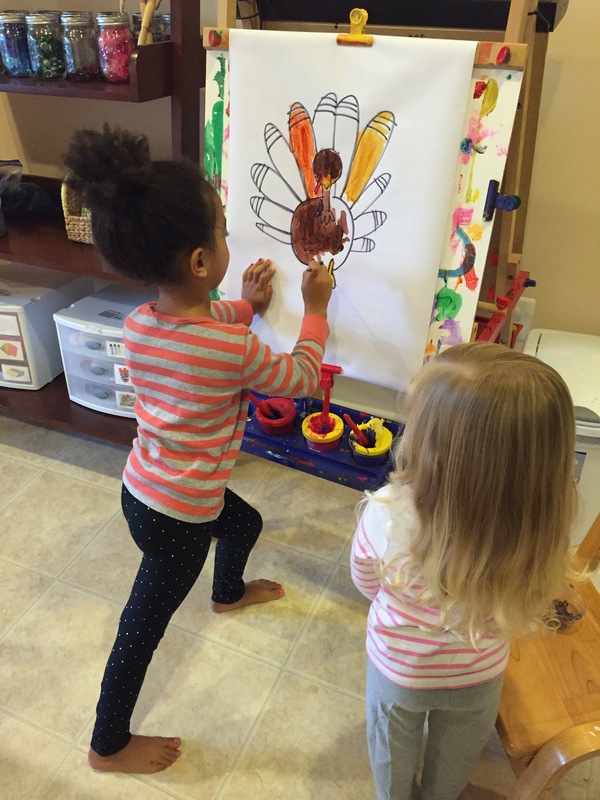 We had so much fun this week making lots and lots of turkeys! 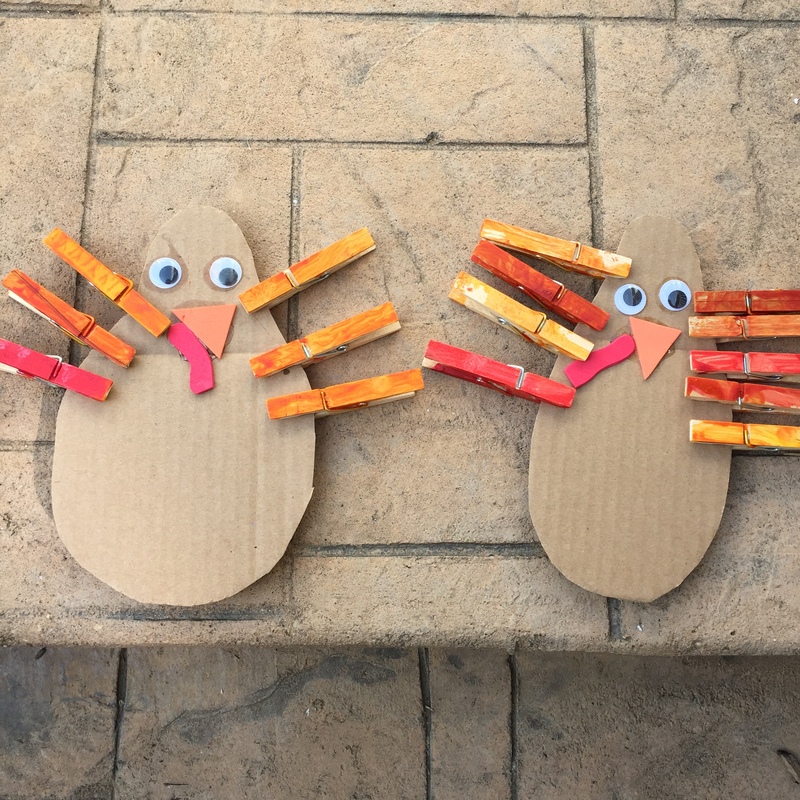 We made these adorable clothespin turkeys using cardboard and painted clothespins. 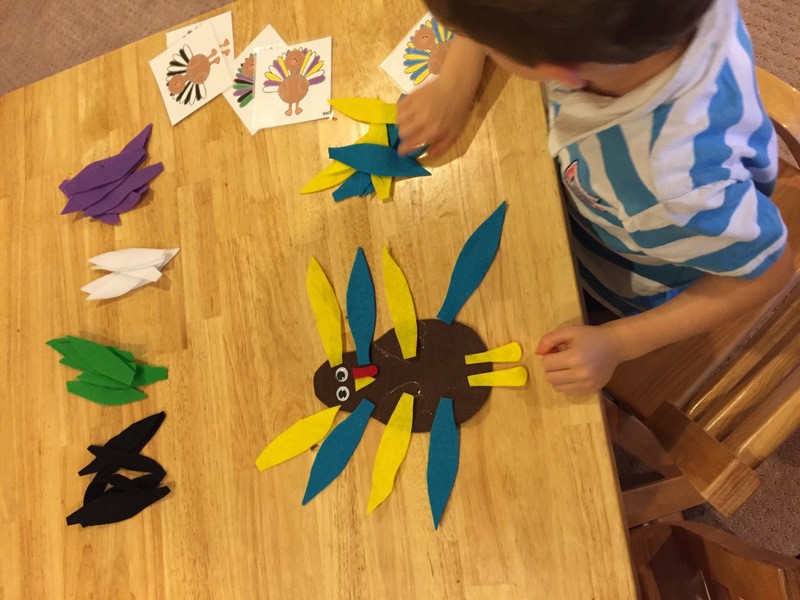 They are great because the feathers can get moved all around, AND it works in a great deal of fine motor pinching practice at the same time! Then we made these beautiful “Salty” turkeys as I called them! 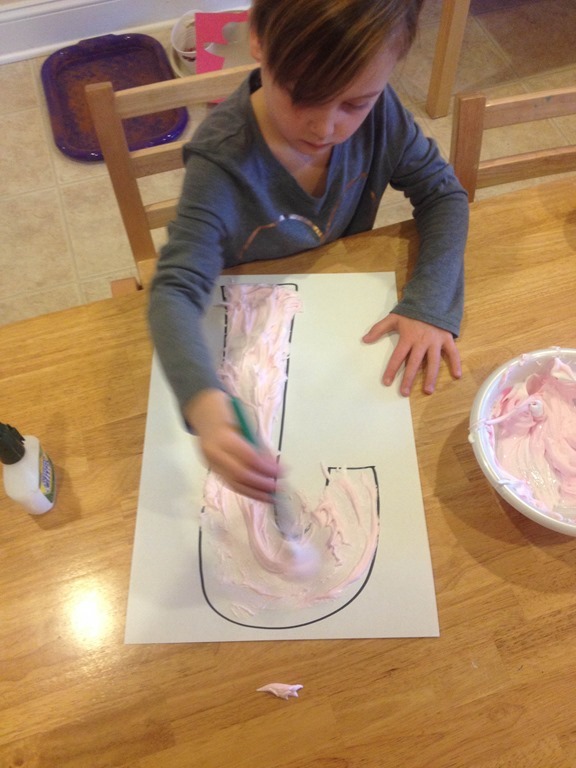 First we drew a turkey outline with glue. Then we covered the entire picture with a huge layer of salt. 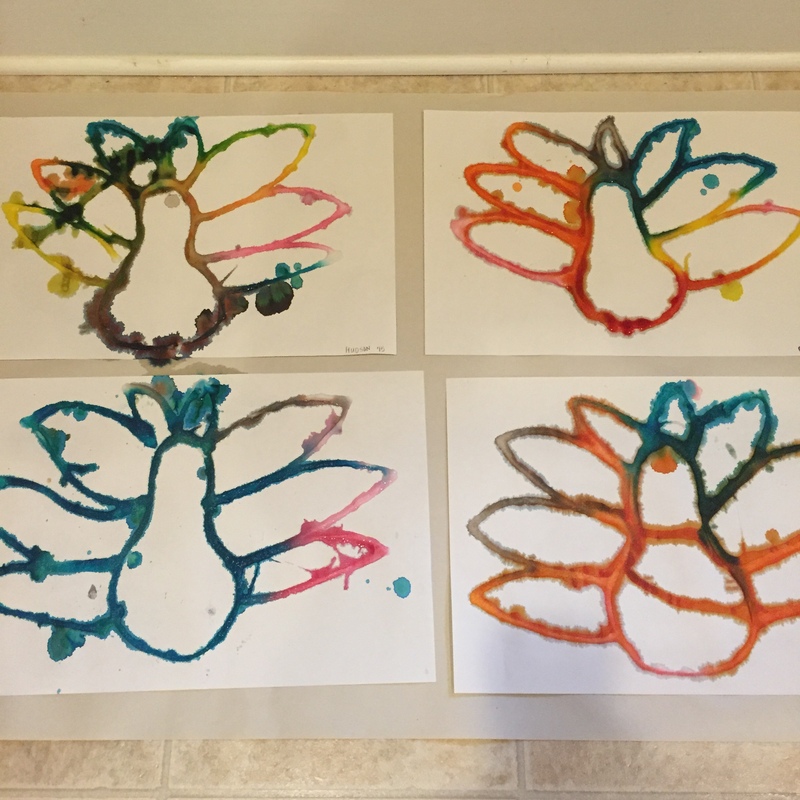 After we dumped the extra salt off, the children used droppers and liquid watercolors to paint the turkey. 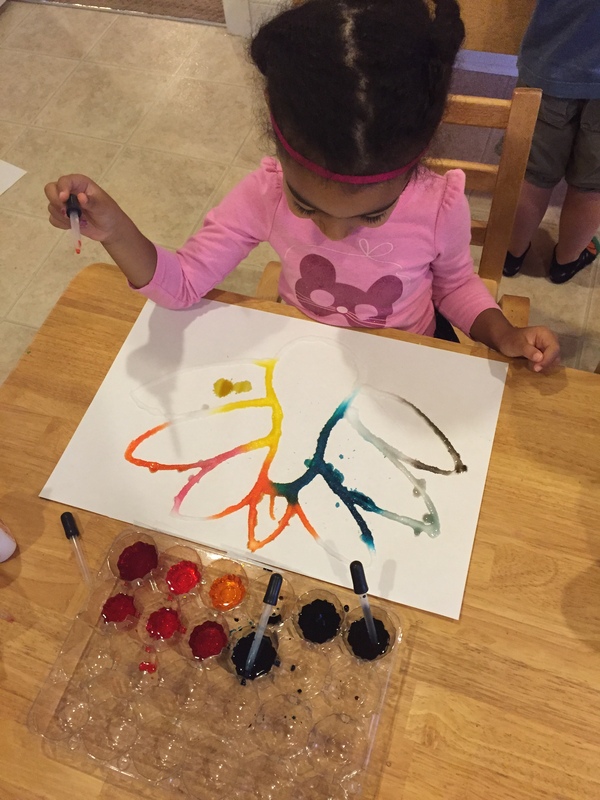 This is an art project and a science experiment rolled into one! 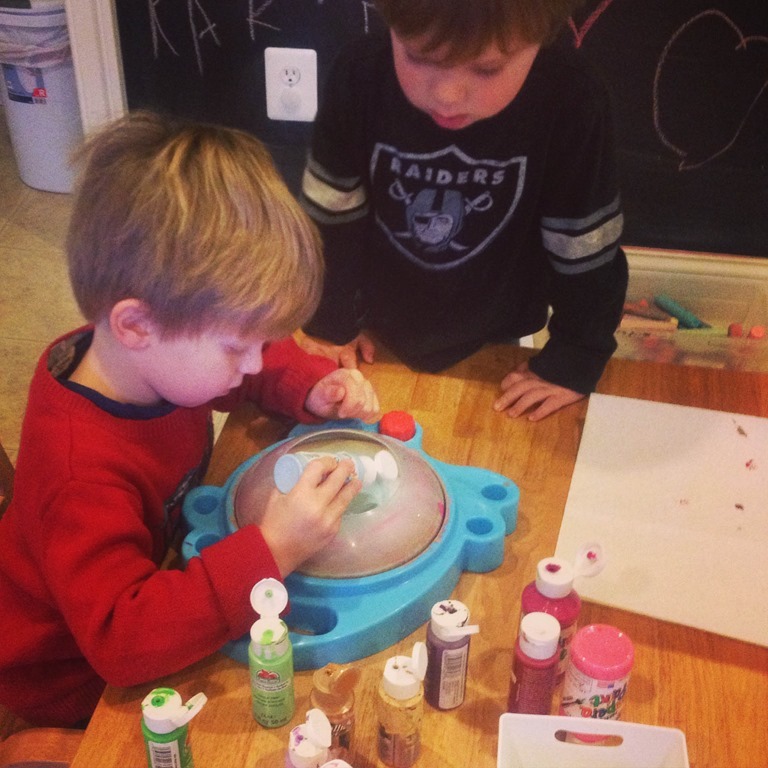 They were fascinated with watching the paint spread out through the salt. Some of the colors even mixed on the salt to make new colors! I tried to take a lot of pictures, because this art is very fragile. Once the salt, glue and paint begin to dry the salt starts to fall off. It definitely isn’t art you can hang on the wall. I tried something new this year, and I sprayed the turkeys after they dried with an acrylic coat of spray, but they still were falling apart. We will send them home (sorry about the mess), but they probably won’t last too long! 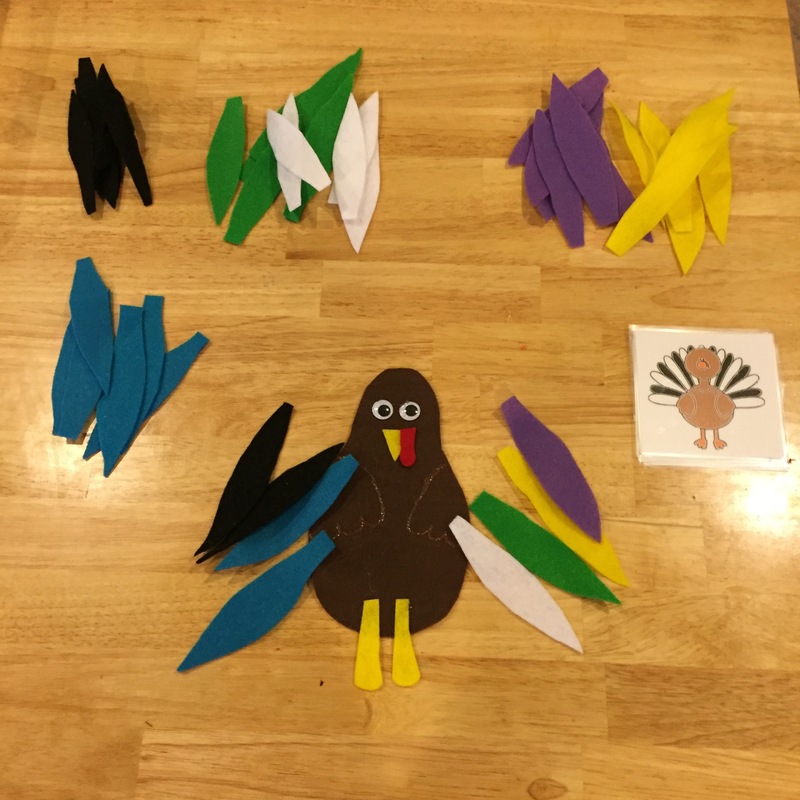 We also made beautiful turkey patterns using this homemade felt puzzle! One of my favorite projects this week was making these Thanksgiving Day Centerpieces. 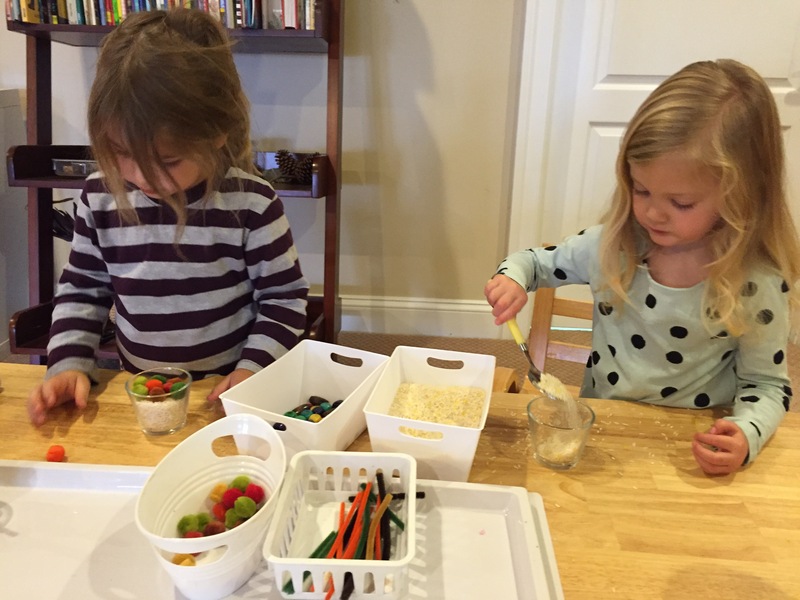 First they filled little glass jars with rice, pipe cleaners, and bits and bobs. They were so creative with this project, and each one turned out so unique. Our final products! We will definitely do this again! This is a picture from our rainy day walk this week. It is so hard to get everyone to look at the camera! 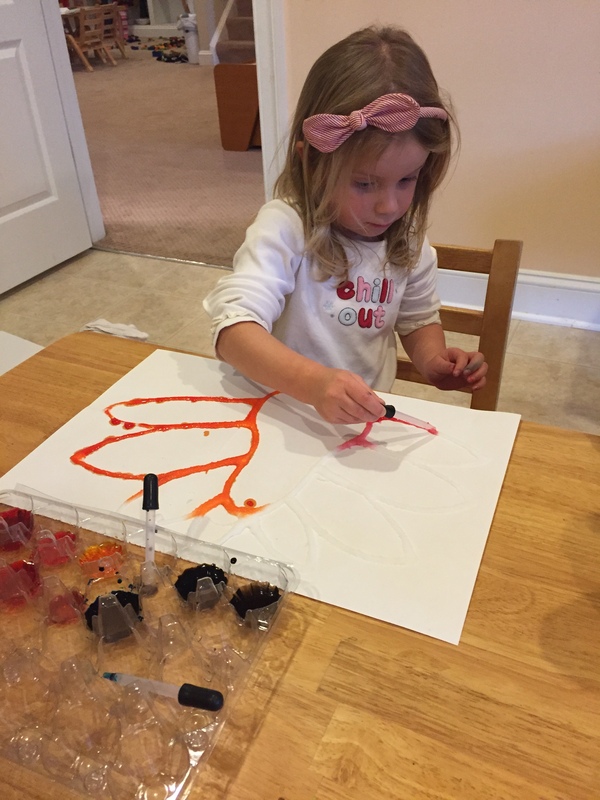 This is little M taking her turkey painting very seriously. 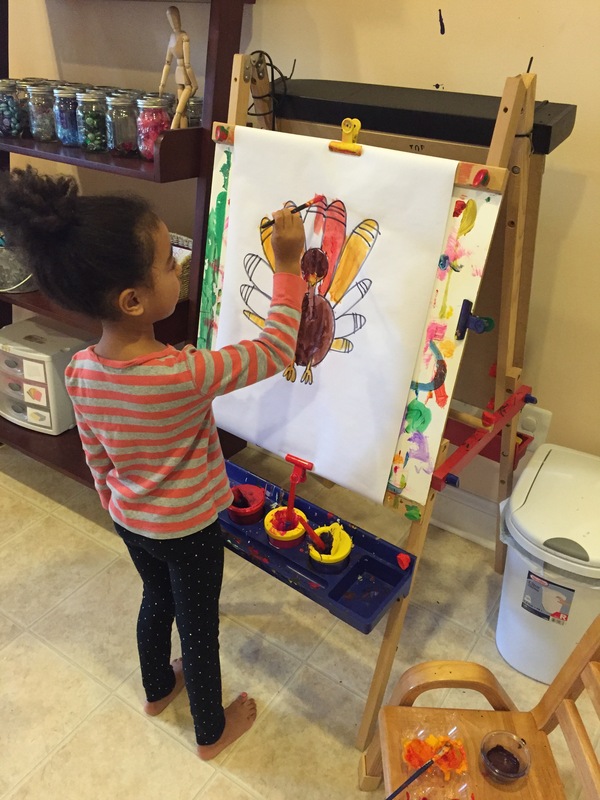 Ms. Brittany drew these awesome turkeys for the kids to paint at the easels. Categories: early childhood education, holidays, Uncategorized | Tags: art, holidays, process art, thanksgiving, thanksgiving crafts | Permalink. 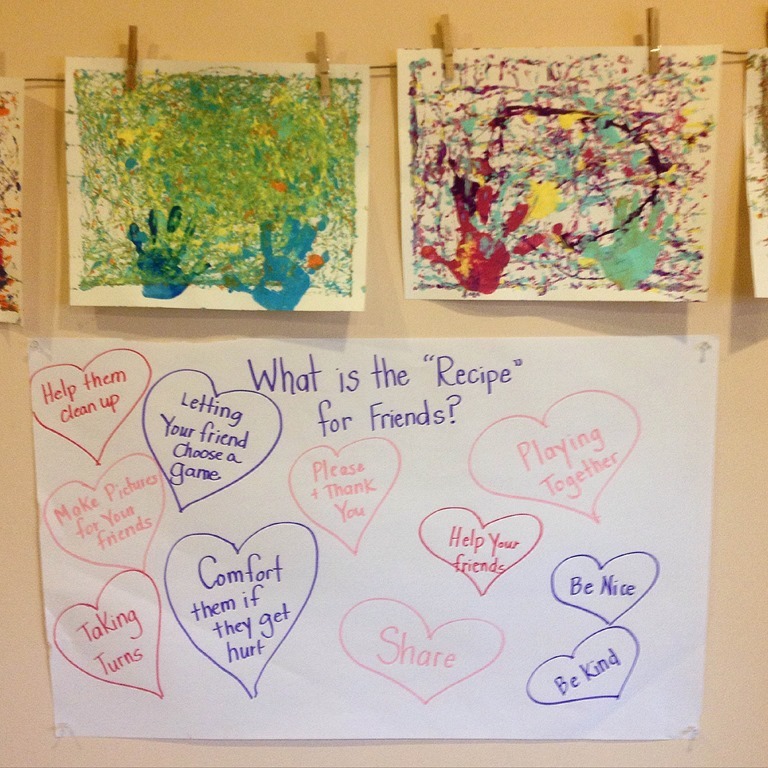 Before we had our great Valentine’s Day Celebration, we took a great deal of time talking about the friendships. We specifically discussed how to make friends, what we do with our friends, and how we can keep or help our friends in our classroom. Above is a picture of our sweet wire hearts we gave to our mommies for Valentine’s Day. 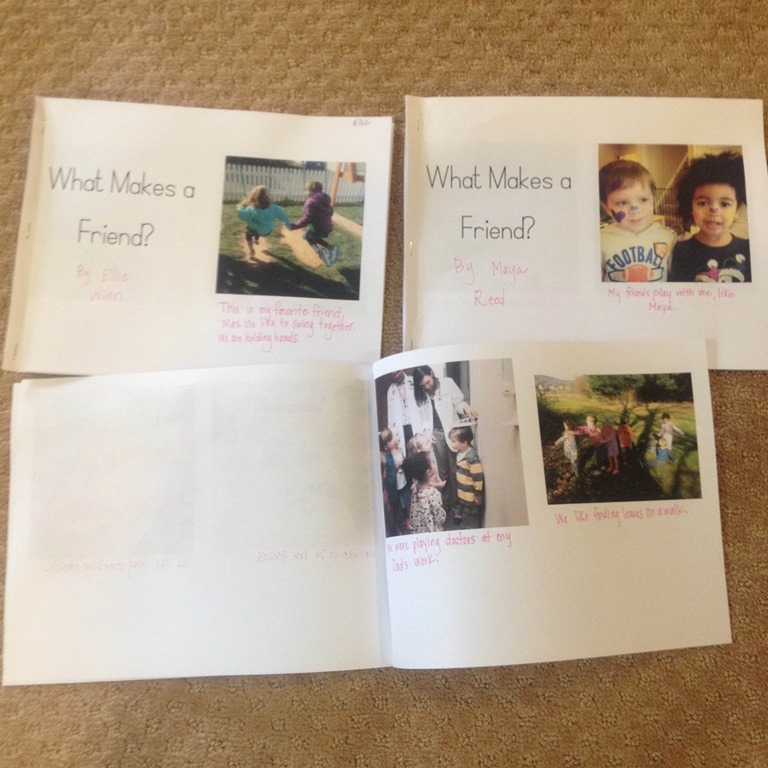 Each child got their own copy of a friendship book I created using pictures of the children doing different activities with their friends throughout the school year. They dictated the words of the book to me, and then we read the books during our meeting time. 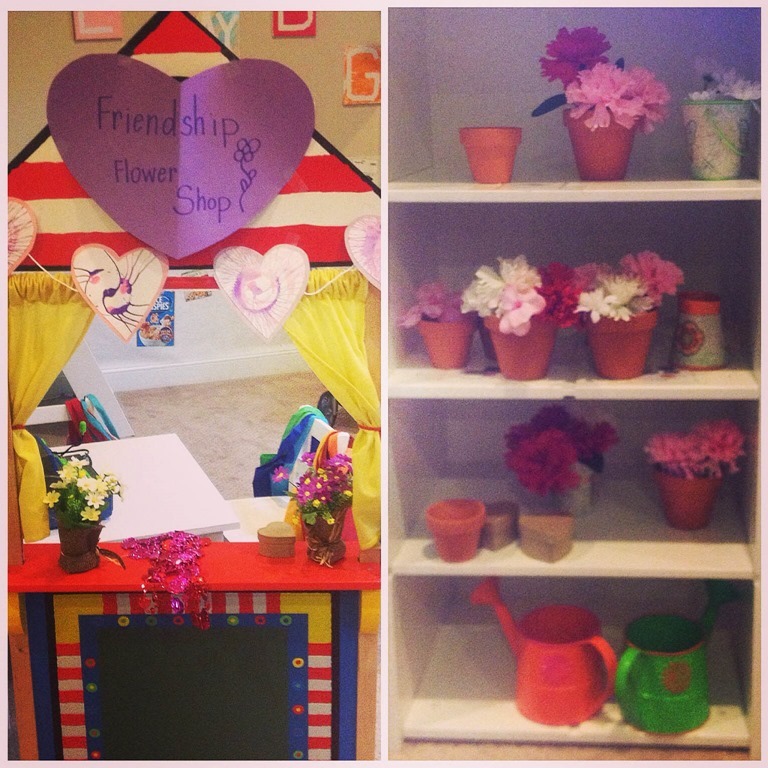 The kids loved our Friendship flower shop that we set up in the dramatic play area. The shop had a cash register, flowers, money, bracelets and necklaces, and lots of loose flowers! 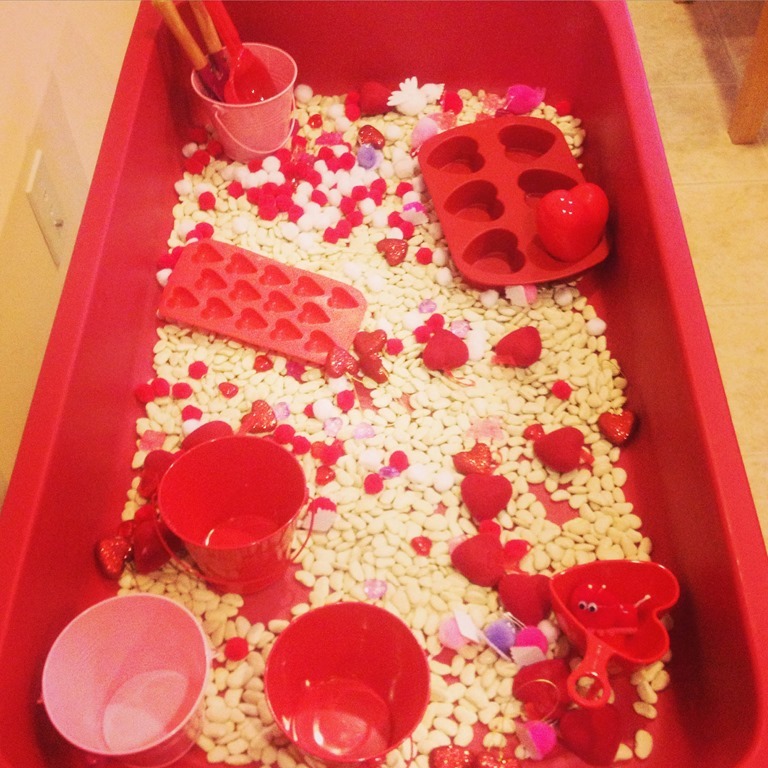 We had so much fun in both of our Valentine’s sensory bins, the Valentine’s Soup and white beans with lots of Valentine’s goodies. 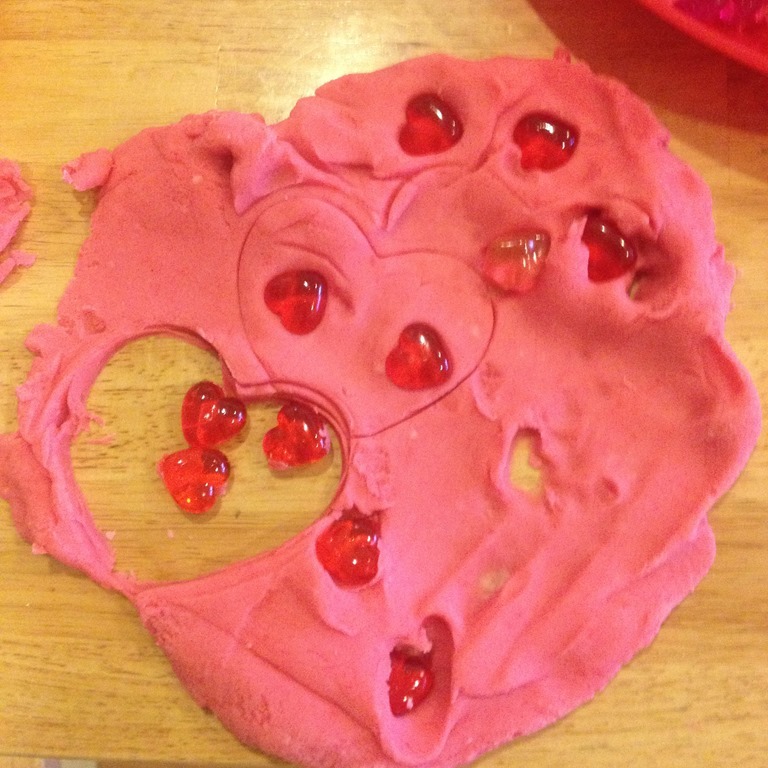 The Valentine’s play dough got lots of use from everyone in the classroom. I always love to go into the art room after they are done and see what types of creations have been left behind by their busy fingers. 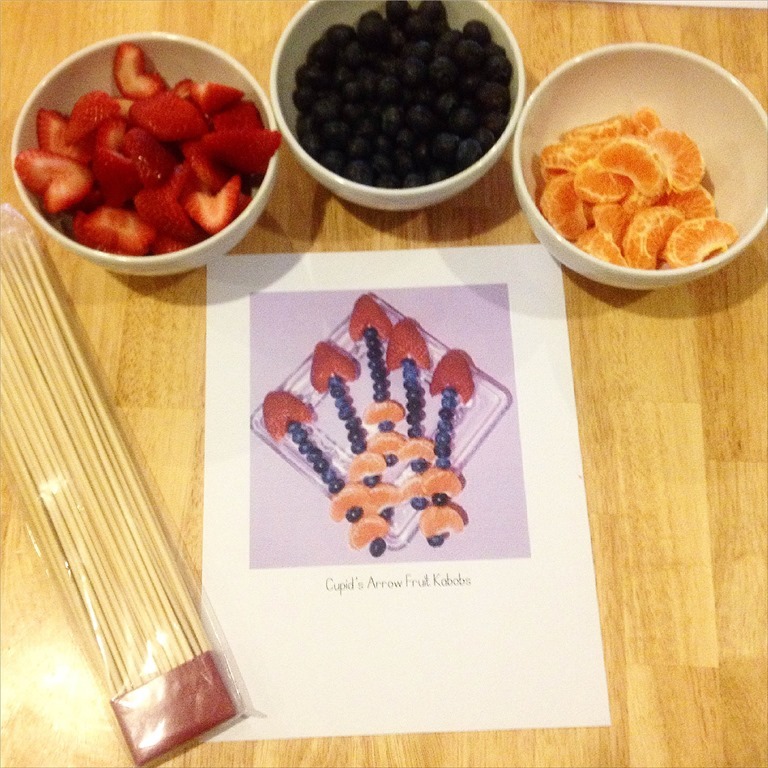 Cupid’s fruit kebobs were one of our favorite snacks as well! 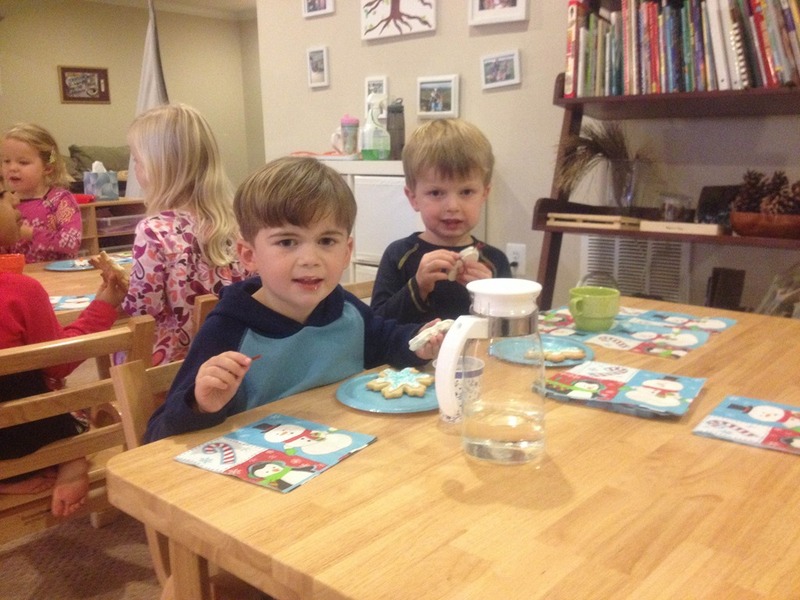 They are getting so adept at serving themselves, and preparing their own snacks. 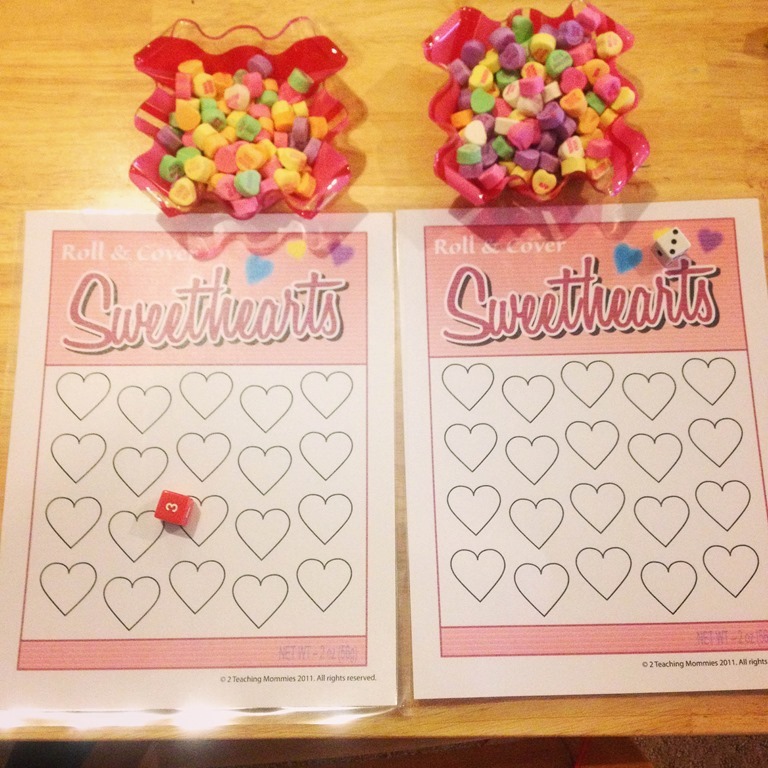 Some other fun Valentine’s fun included the Sweethearts game pictured below. They had to roll the dice and fill up the Sweethearts board with heart candies. L and D were loving the spin art hearts we made! 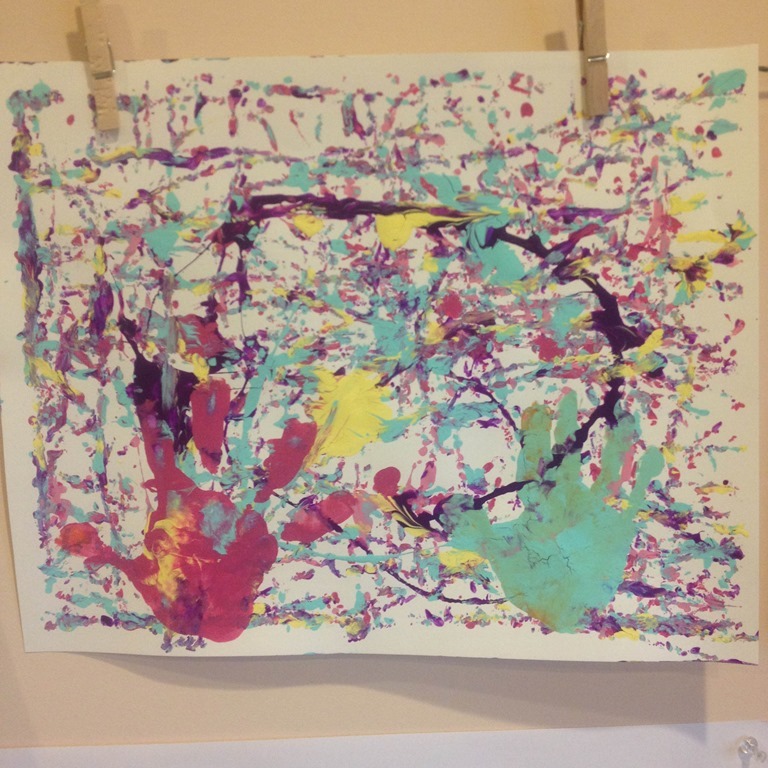 Each child got to work on a “Friendship Painting” by rolling balls in a box by working together to get the paint splattered all over the paper. At the end of the painting they each painted their hand and put in on top of the picture. We also gave ideas for what our recipe for friendship would be during morning meeting. 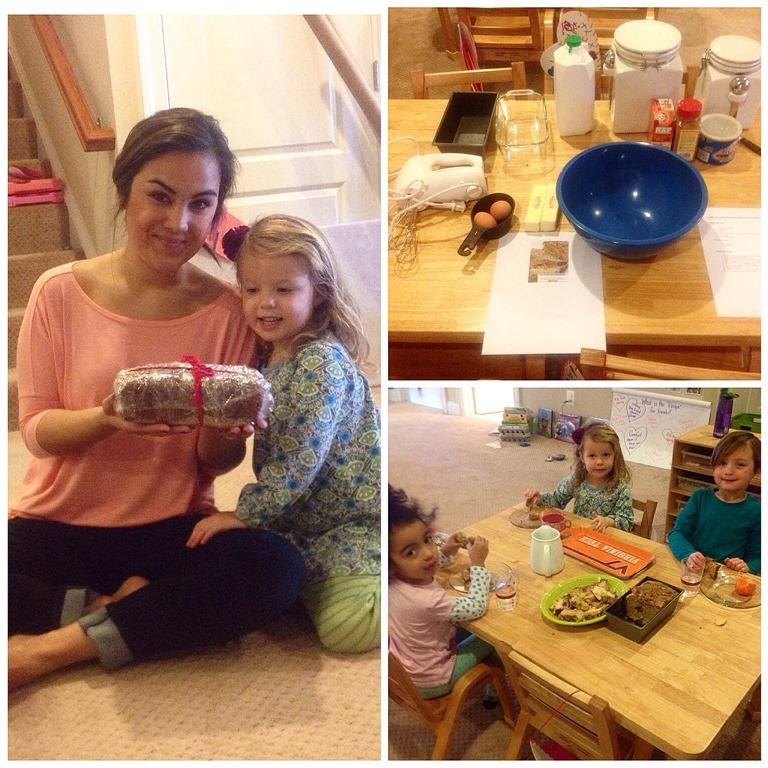 One of our favorite baking activities was making a loaf of friendship bread. We made two loaves, and gave one loaf to our favorite assistant Brittany! Now that I am back up and running on my computer, I should get us up to date on our blogs and happenings in the classroom! Categories: holidays, preschool | Tags: cooking with kids, friendship theme, holidays, valentine's crafts, valentine's day | Permalink. 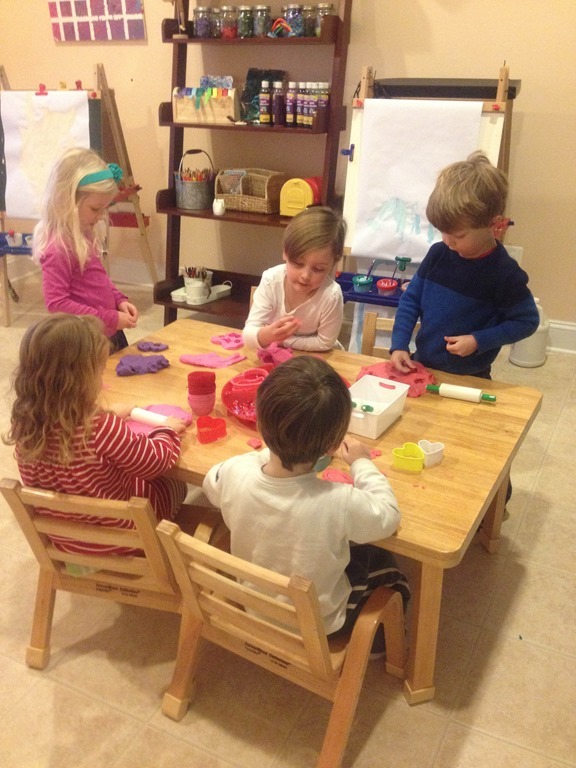 We had so much fun celebrating Valentine’s Day a few weeks ago! We got the chance to have a small party in the classroom, and enjoy each other! 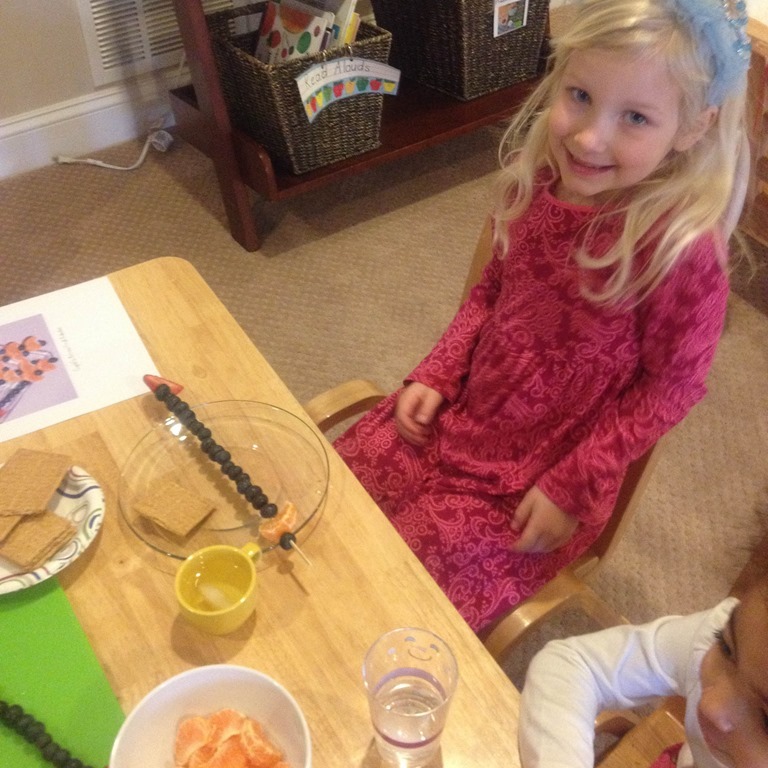 Valentine’s Day started with some face painting, and necklace making. 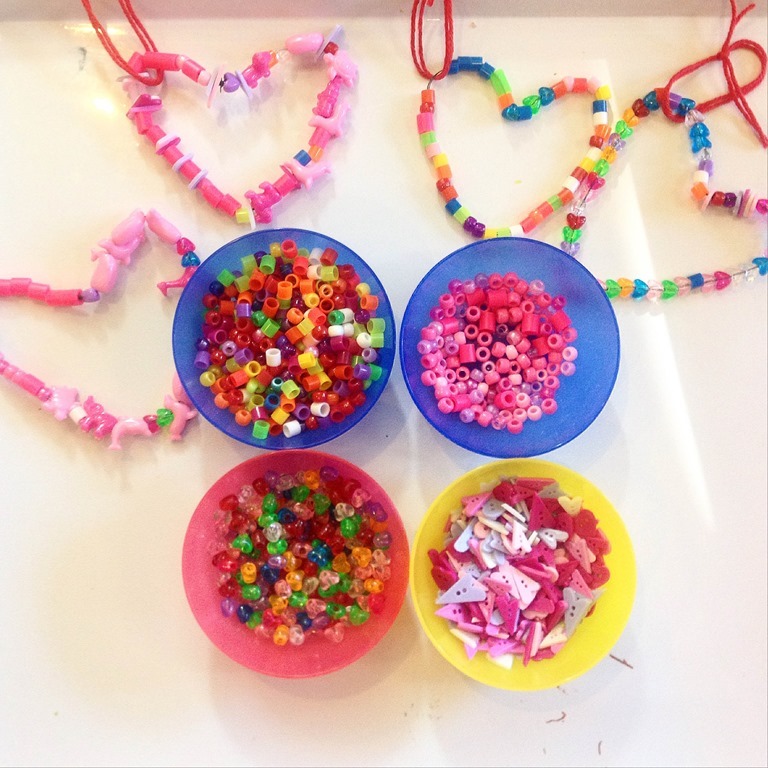 Instead of making necklaces for themselves, the finished necklaces were given to a friend in the classroom! Extra care was taken to string necklaces for our buddies! 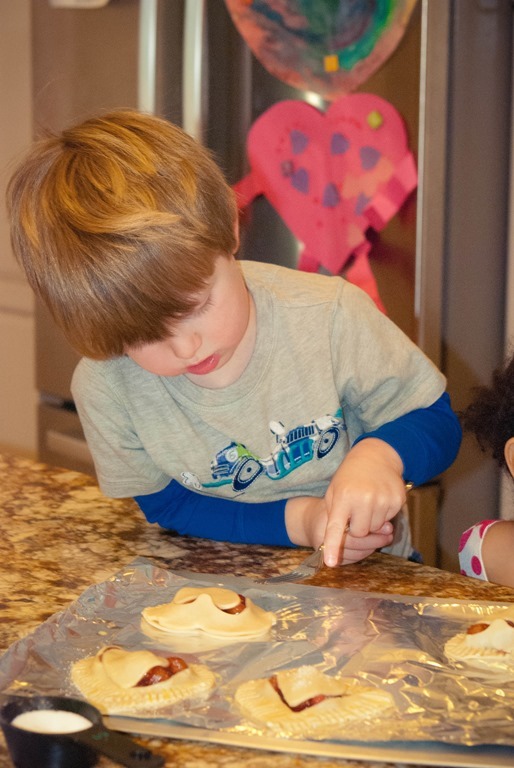 We did a TON of baking the week of Valentine’s Day! 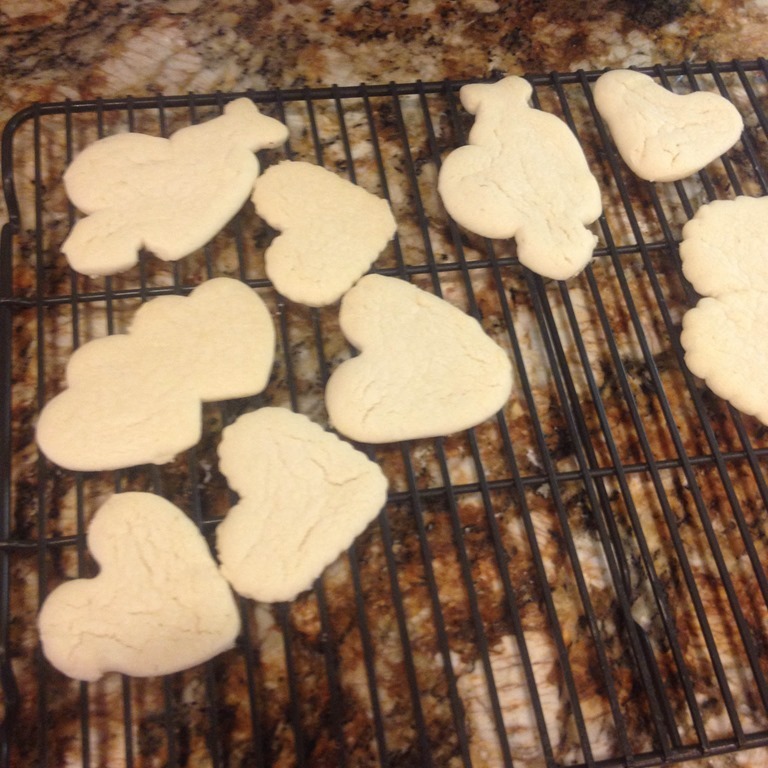 First we made our own sugar cookie dough, rolled our dough, and stamped our own heart cookies. They looked quite sweet after we baked them in the oven! 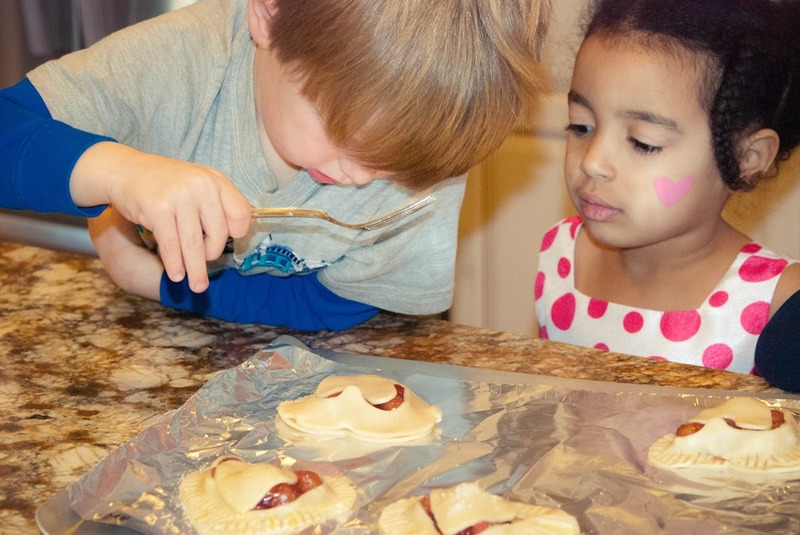 The morning of our Valentine’s Party we tried our hand a mini heart cheery pies. This was our first time making cherry pies, and they turned out perfectly. 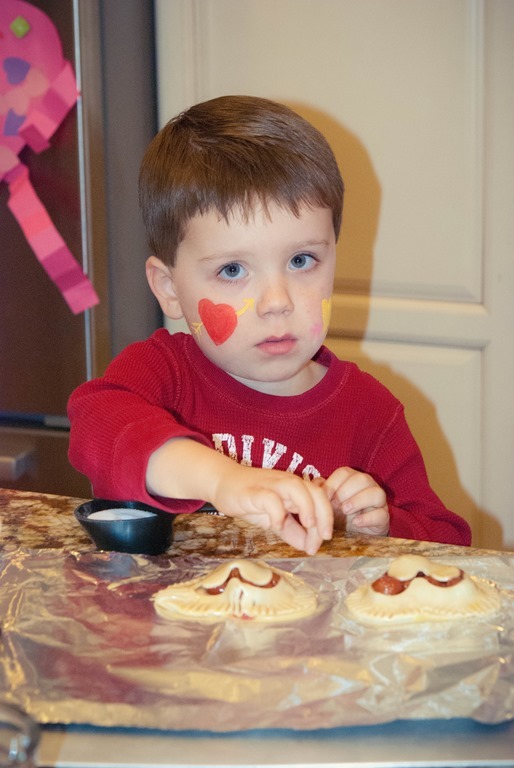 We rolled out the dough, cut out our hearts, put in our filling, and shut our pies by pressing a fork around the edges. Then we sprinkled some sugar on top! Lastly, we licked our fingers to remove any extra sugar! 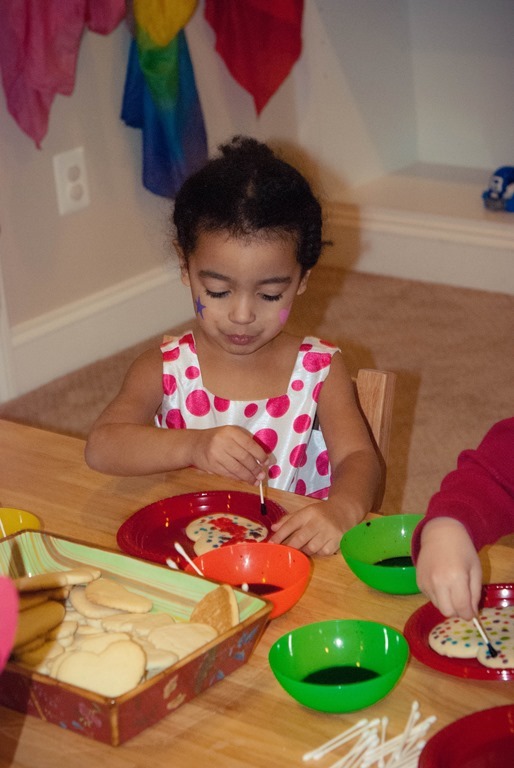 Then our parents arrived, and we got to work decorating our cookies! Instead of mounds of sugar and sprinkles we opted for a different decorating technique! We dipped q-tips in food coloring and made designs on top of our cookies! 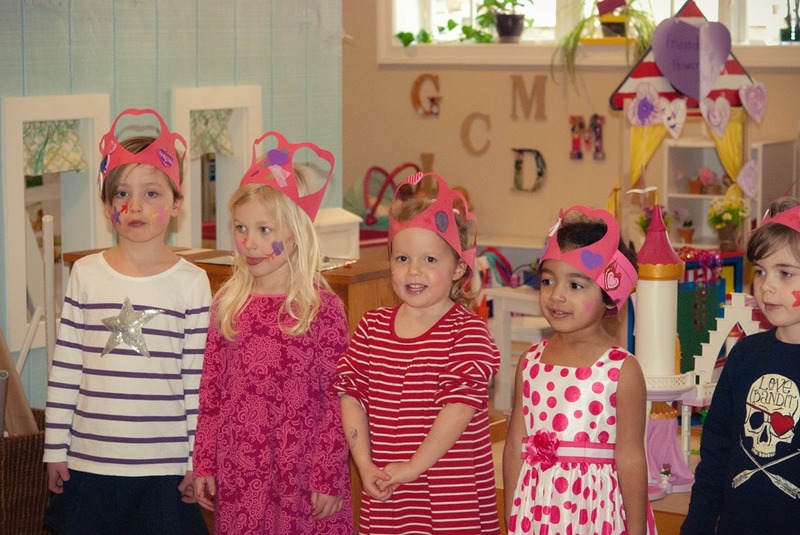 We also played some Valentine’s math games, decorated heart crowns, and enjoyed our snacks. Before leaving the parents got to hear some of our friendship songs we had learned in the past two weeks leading up to Valentine’s Day. All in all it was a great day celebrating all of these cuties and their friendships with each other! 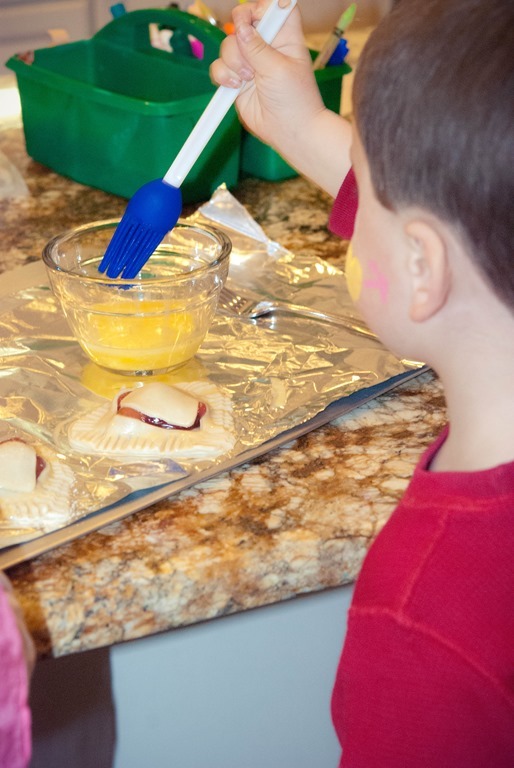 Categories: holidays, home based preschool | Tags: baking, cooking with kids, holidays, valentine's day | Permalink. Even while we were focusing on our letters each morning, the classroom was filled to the brim with lots and lots of Christmas fun! The first week in December the children walked into the art room to find Playmobil Santa had landed in our art room on a pile of white cloud dough! The cloud dough was filled with silver glitter for some added sparkle. 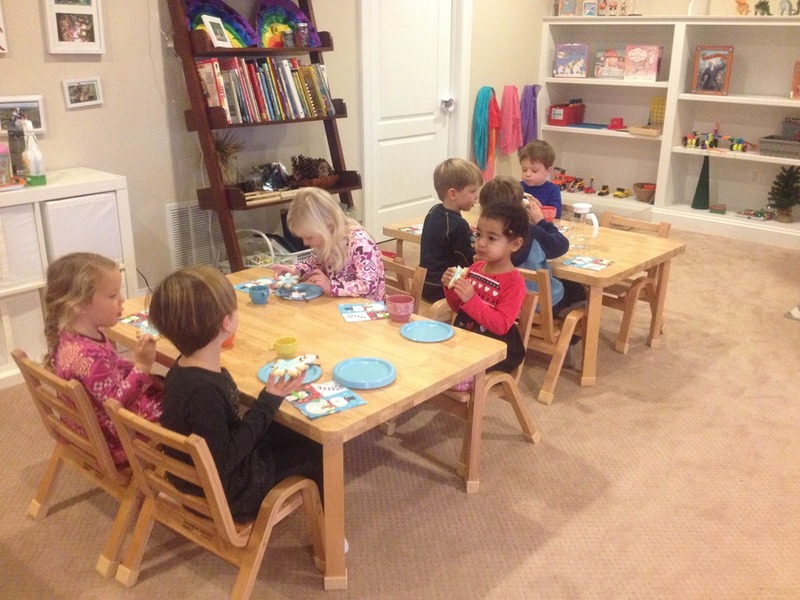 The tables were filled with fun invitation to decorate Christmas trees in a few different ways. We had a felt tree, a tree on the old Light Brite, and a mini Christmas tree with little ornaments. They got a chance to decorate and re-decorate their trees throughout December. 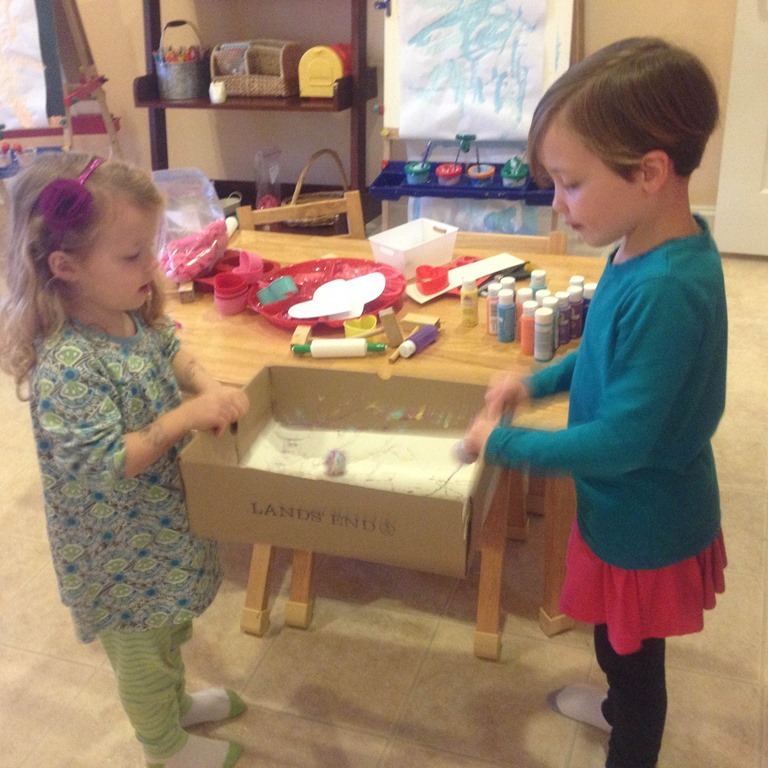 For some themed sensory play we had a large tub filled with fake snow. Then I filled it to the brim with snowman cups, Christmas goodies, and present boxes. 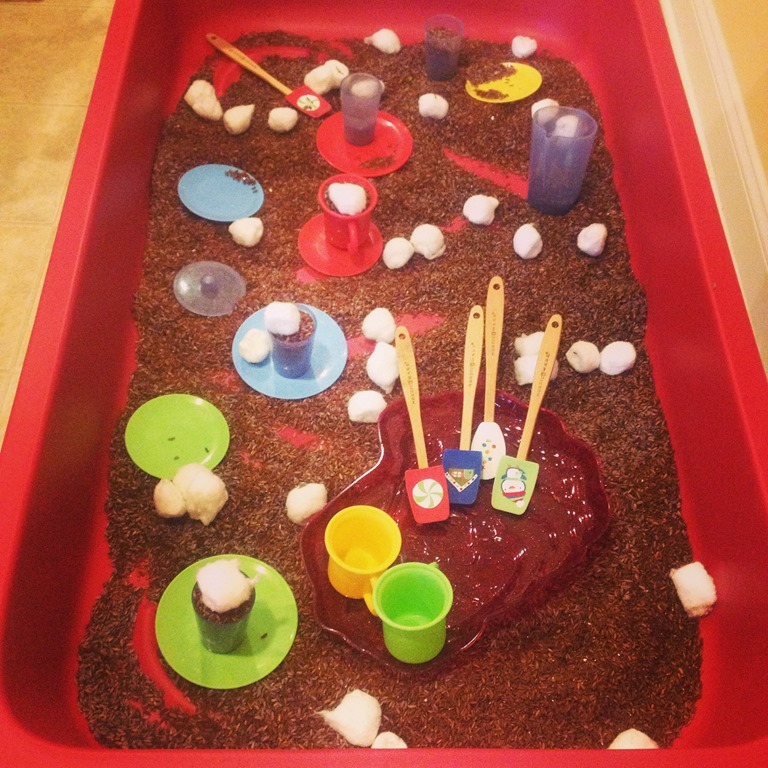 We also had fun digging into the hot chocolate sensory tub. I dyed rice brown last year and also added chocolate extract to made it smell like cocoa. I was surprised to find that the rice still smelled great when I opened the bag from last winter! I added some holiday spatulas, cotton balls for marshmallows, and cups and plates. We also had a lot of fun working with a new art process. Buggy and Buddy highlighted this technique on her website, and I thought it looked fun and the end product was beautiful. First we filled a tray with Sta-Flo (liquid starch). 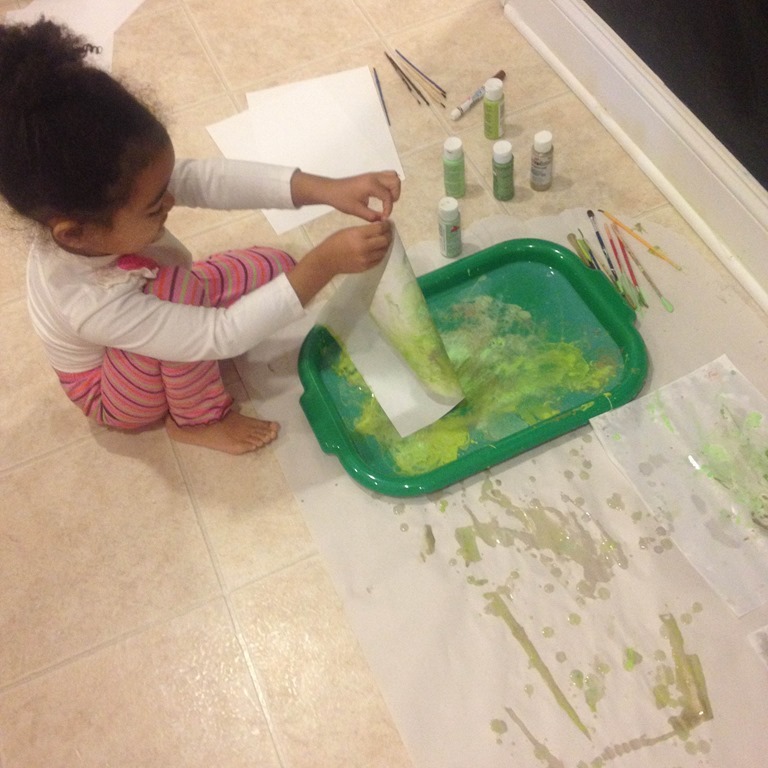 Then each child dropped acrylic paint onto the Sta-Flo starch. 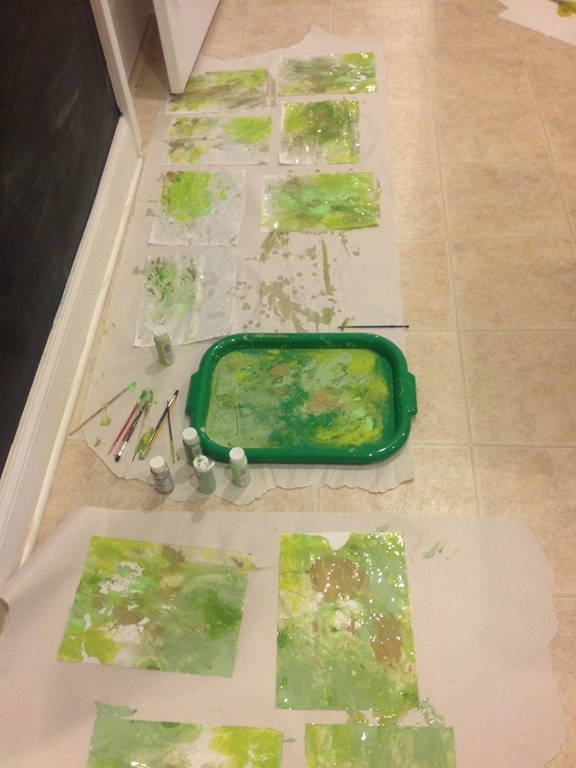 After swirling the paint around on the pan each child laid their watercolor paper onto of the starch. It was quite drippy and messy, but we embraced it! 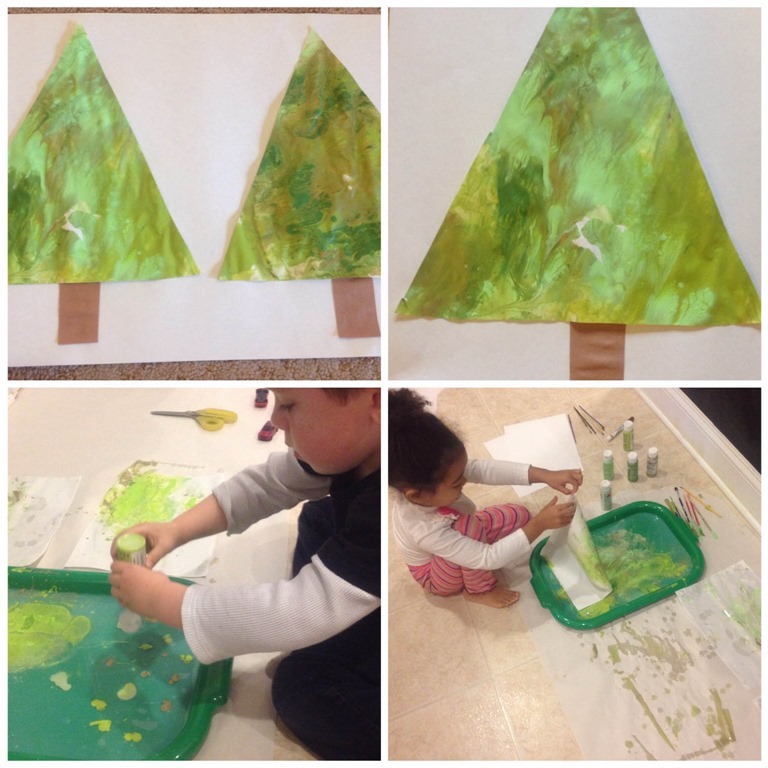 After the papers dried I cut them into Christmas tree shapes, and we glued them down onto white paper. I thought the end product was lovely and each tree was so different. 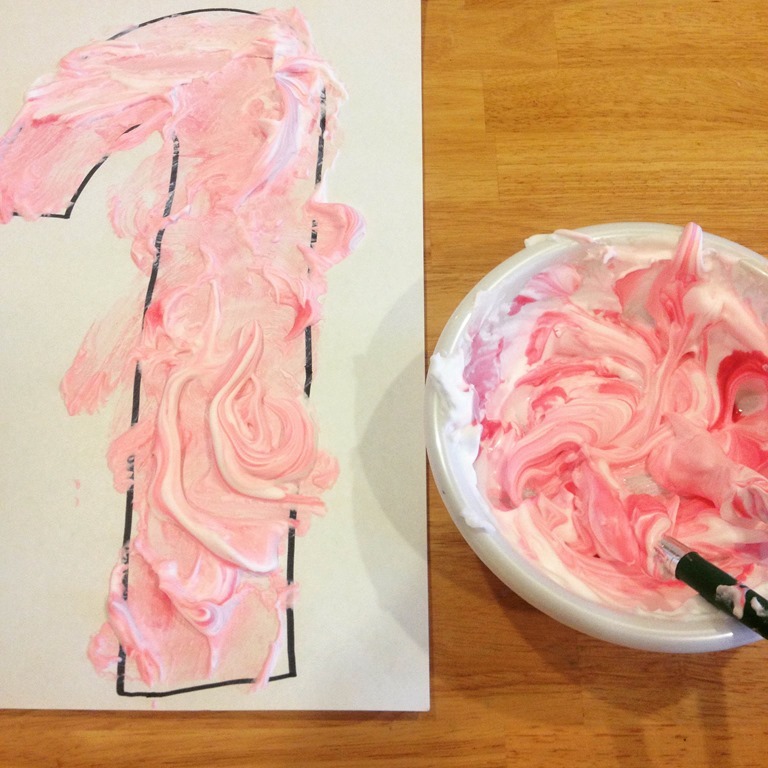 We also made some Candy Cane puffy paint. 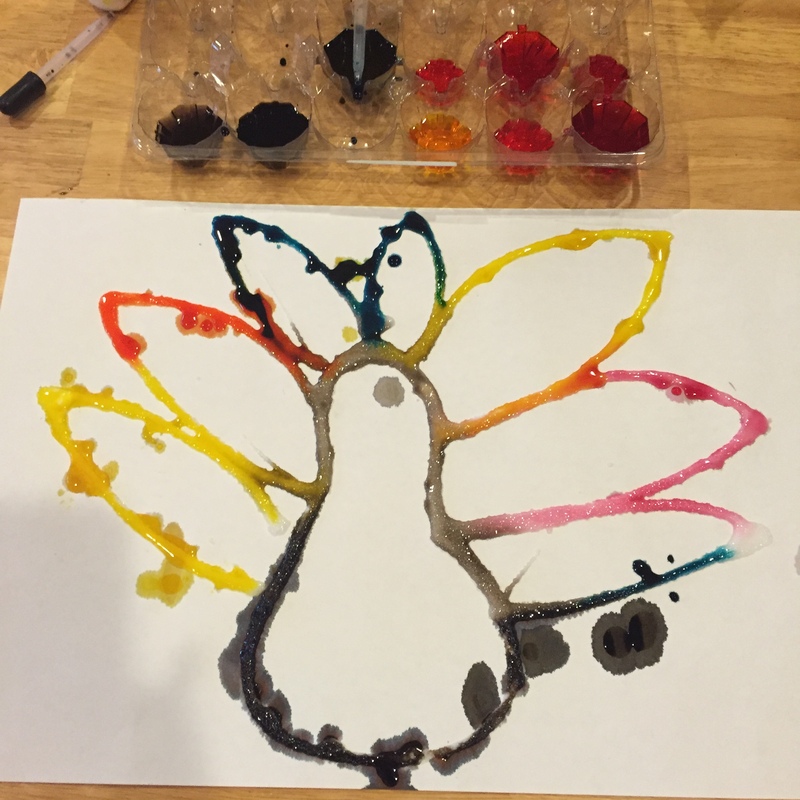 We mixed glue and shaving cream and red watercolors for some puffy paintings. 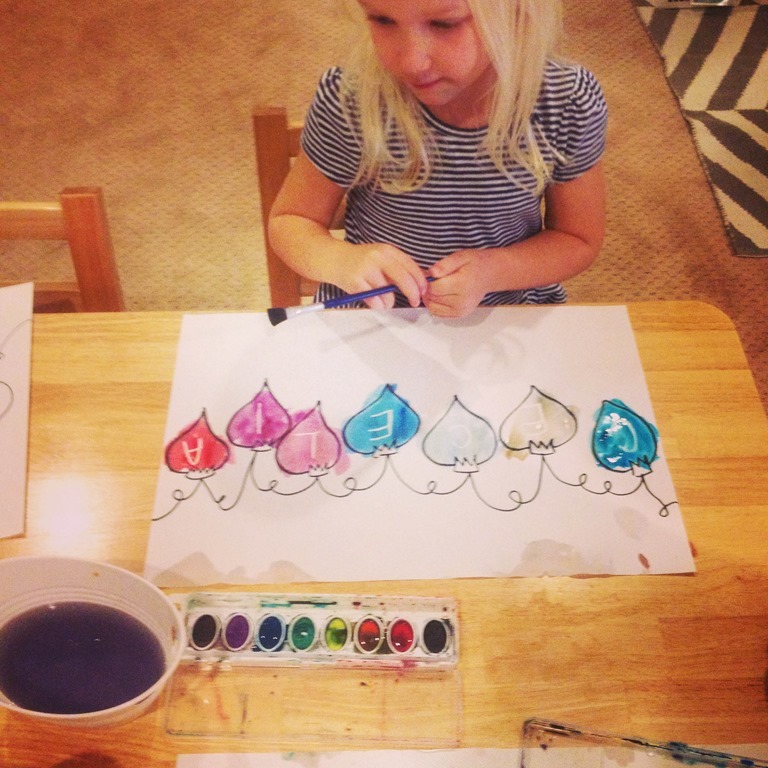 We also found our names hidden inside of ornaments while we watercolored! We also had fun celebrating L’s 5th birthday! 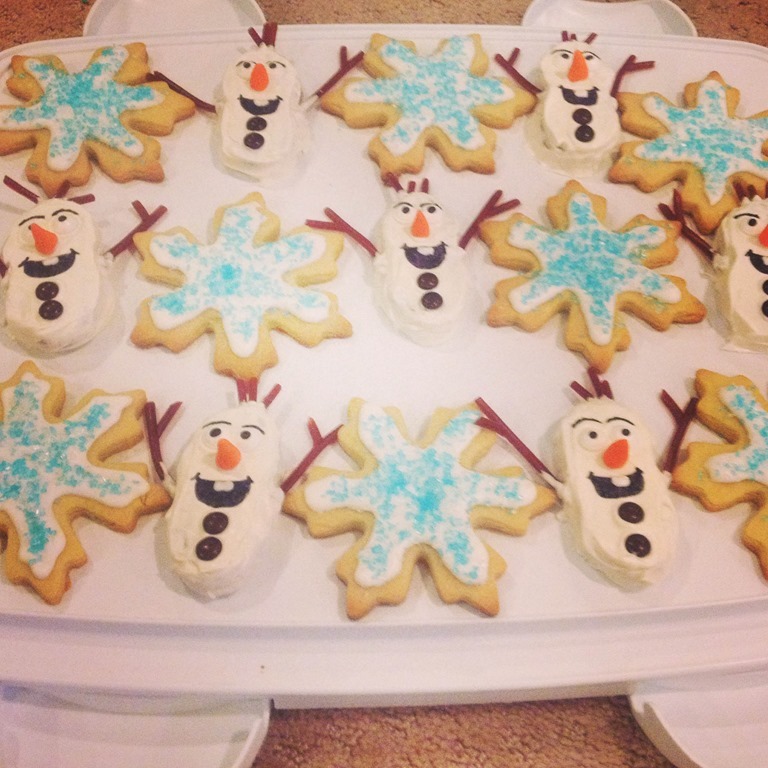 Thanks to his mom for these fabulous Olaf and snowflake cookies! 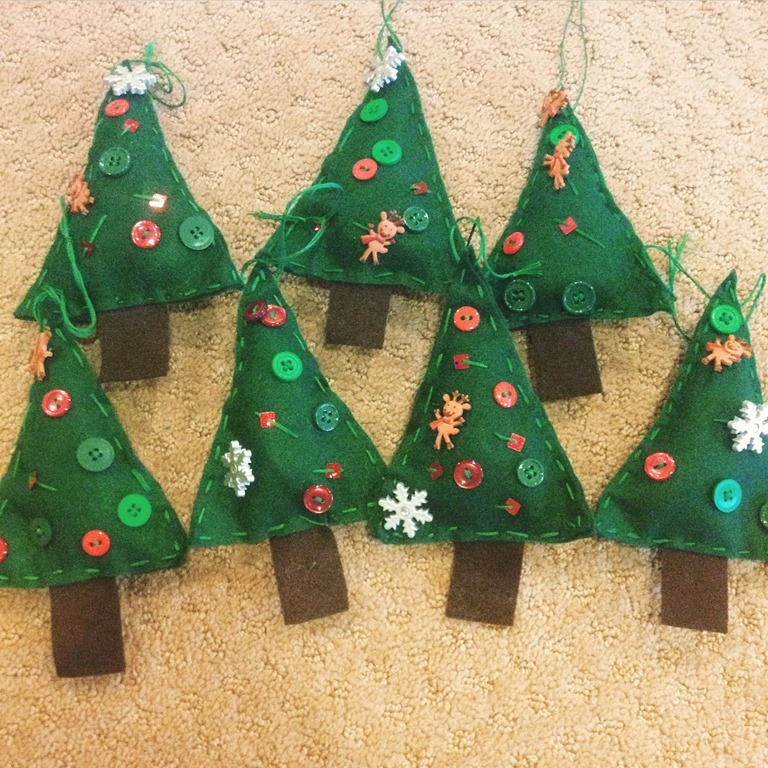 The kids worked on these beautiful Christmas tree ornaments for their parents. I hope they were surprised when they opened their gifts! 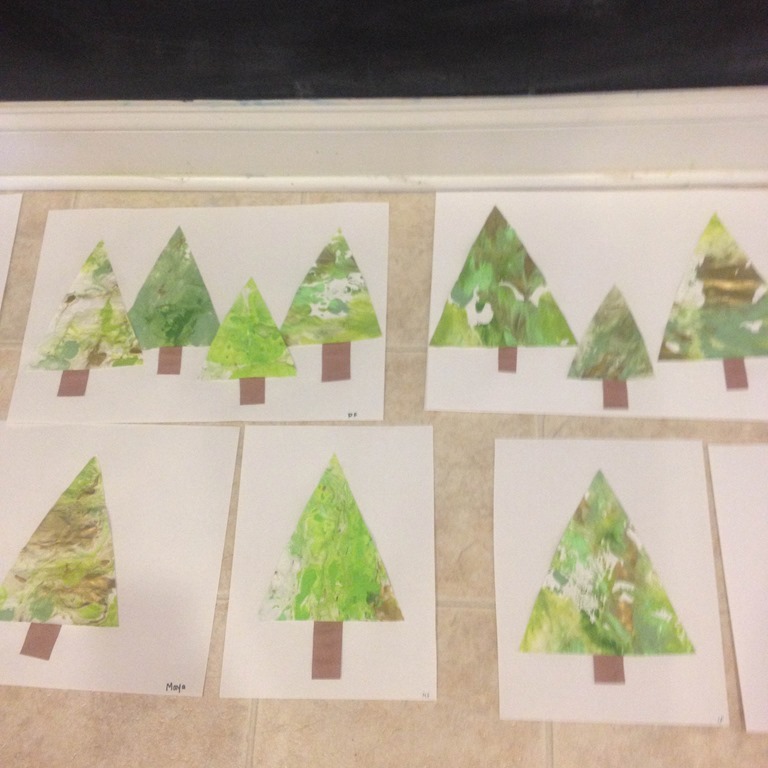 Each child planned out their tree, and they are each so different. I helped them with the sewing, but they quickly caught the hang of it. Then we sewed the tree closed and added stuffing to the inside. Of course they each wrapped up their tree for their parents to open. I also saw this simple coloring idea on Buggy and Buddy. I made a sheet for each child and they added all of the details. 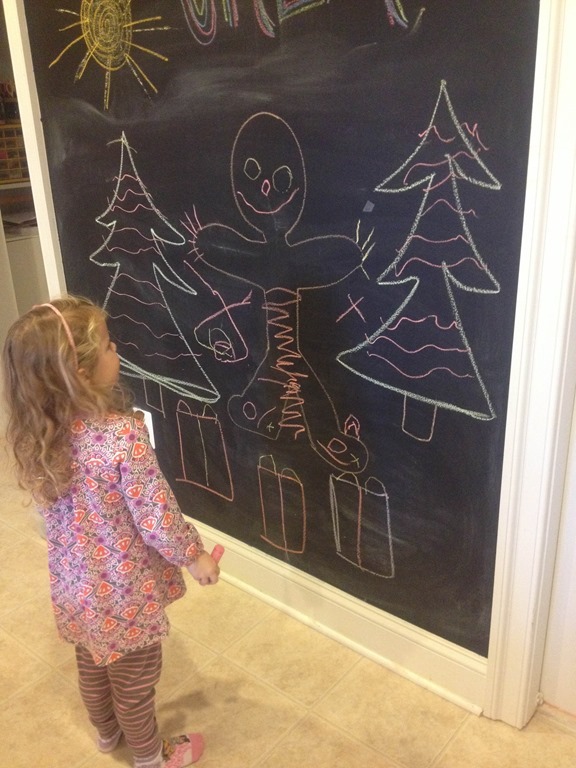 E even added a string of lights behind her tree. They were really drawn to this activity. Sometimes coloring books have so many details, and think the simplicity of the coloring paper made it fun for them. 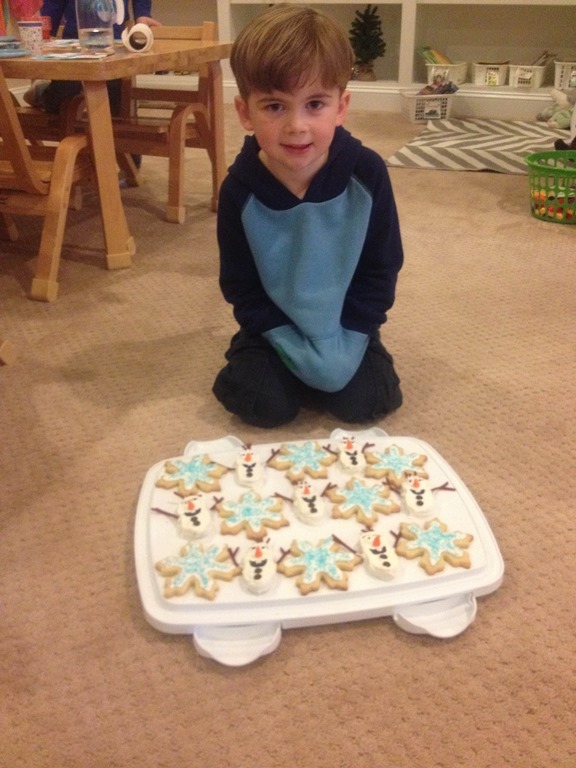 We also had some fun holiday themed learning trays, too. They worked on moving the holiday erasers into a gingerbread men muffin tray. 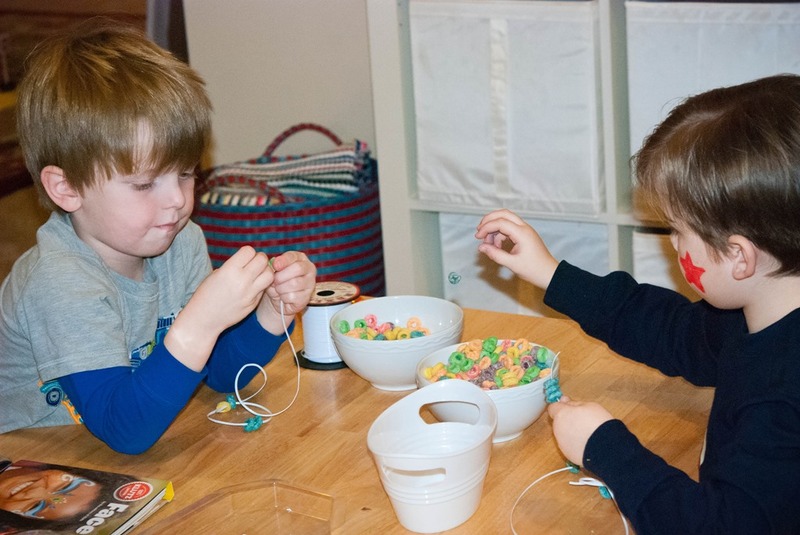 They also got a chance to make icicle ornaments with these fun glittery pipe cleaners. 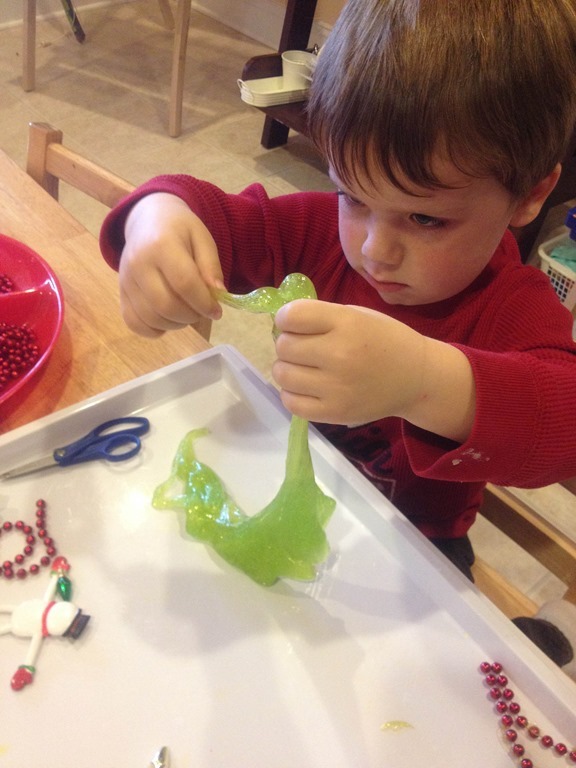 After reading The Grinch Who Stole Christmas we made some fun glitter “grinchy” gak. 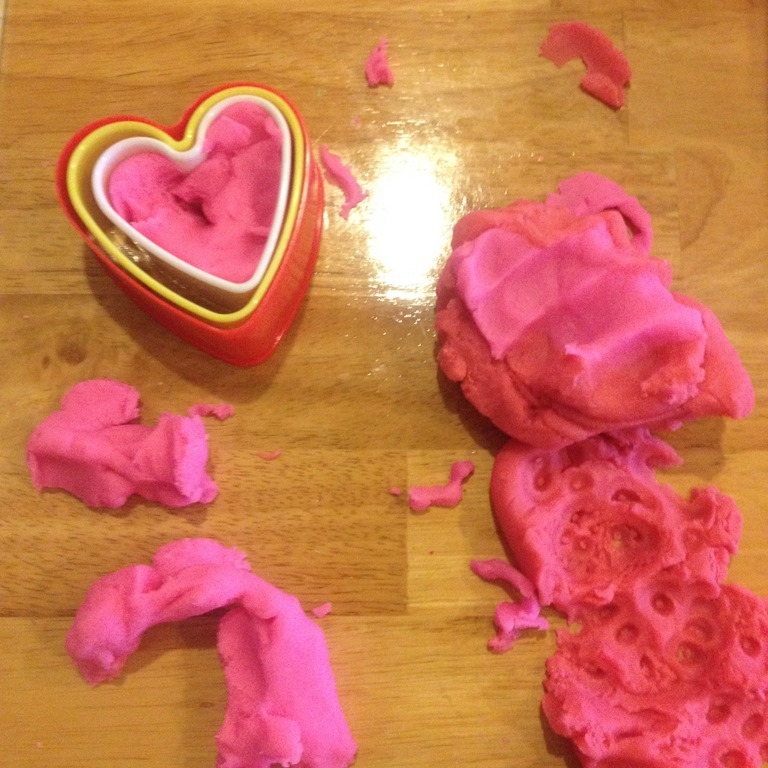 We loved exploring this glittery gak. 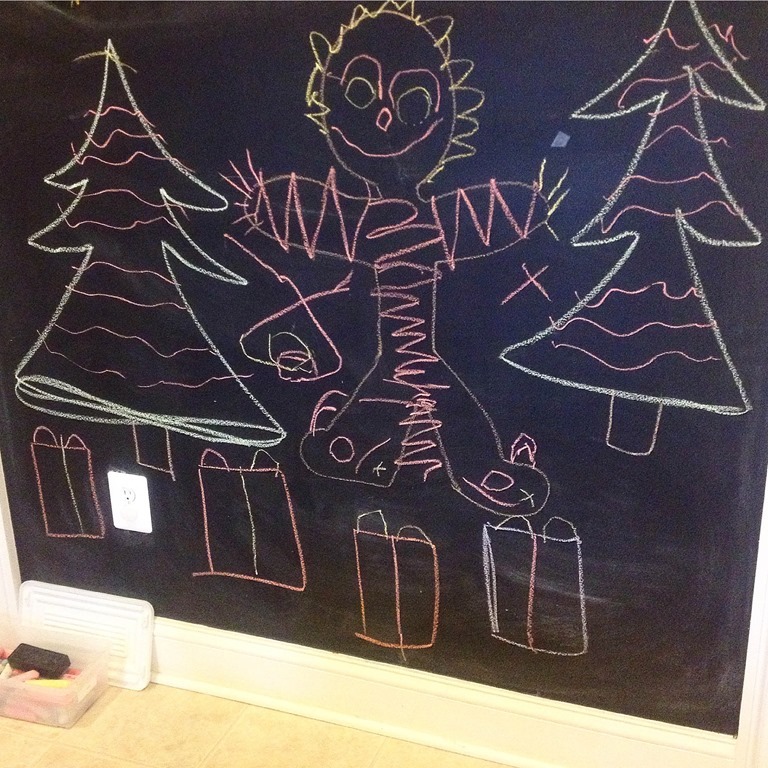 When they had so much fun filling the Christmas coloring pages, I left the invitation to fill in Christmas trees and gingerbread men on the chalk board. E went to town filling it out one morning. All in all it was a very Happy Christmas in our classroom! 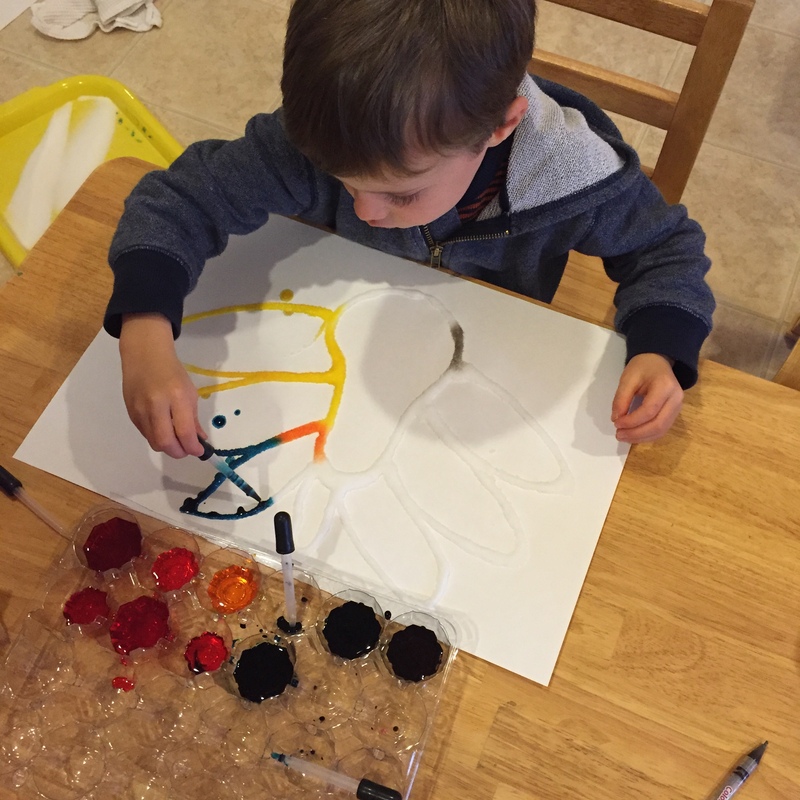 Categories: holidays, home based preschool | Tags: christmas, christmas crafts, holidays, painting, play based preschool, preschool crafts, sensory play, sensory tray | Permalink.